Of course, the NHS has had to exist within a capitalist society that has given rise to many contradictions and ambiguities from a communist point of view. The distribution of health services may be based on clinical need not the ability to pay, but this ‘clinical need’ is necessarily defined, not by the users of the health service, but rather restrictively by an elite medical establishment. As a result the NHS can be seen to be little more than a sickness services that is only allowed to treat the illness not the causes of diseases generated by capitalism, and whose prime aim is to get people back to work. Furthermore, although the NHS may be based on a communist principle of distribution, it necessarily produces health services on the basis of alienated wage labour. The work organisation of the NHS still bears the imprint of the military origins of modern health care. And to the extent that NHS workers care about what they do then this sense of ‘vocation’ has all too often been used as an excuse for low pay. The establishment of a universal and comprehensive health service, free at the point of use and delivered as a nationally integrated public service, has been a boon not only for the working class, but for the vast majority of the British people, it has also been remarkably cheap to run for the British state and capital. Although the NHS has delivered health services comparable to anywhere else in the advanced capitalist world it has done so at far less cost and far more efficiently. This is clearly the case if we compare the British and US health care systems. In the US the state spends more per head of population on Medicare, Medicaid, public hospitals and other remedial public health care schemes and services required to patch up the US health care system, which is based on private insurance and private health care provision, than the British government spends on the entire NHS. The total spending as a proportion of GDP on health care in the US, both private and public, is more than twice that of the UK. • Why has the NHS proved so cost effective? • What is driving this tendency towards an evidently more costly form of health care system? After all have not higher health costs for workers in the US made American capital less competitive? • To what sense was the NHS a gain of the working class and what will be the consequence of its demise? What is the significance of this move towards a US health care system for the working class? We shall consider such interesting questions in more detail in part II of this article, which we hope to publish in the next issue. But more immediate and politically urgent is the need to address the issue of the current attempts to dismember the NHS put forward by the Andrew Lansley which at the time of writing are going through parliament. Yet despite the dire warnings that the NHS would soon be a thing of the past, the NHS so far has remained more or less intact. If we are to understand the significance of Lansley’s proposals then it is necessary to place it in its historical context. It is necessary to consider not only how the drive to reform and dismantle the NHS has developed but also the formidable obstacles and contradictions it has encountered. We have to see how attempts to dismantle the NHS have so far failed before we can evaluate the prospects for Lansley’s proposed assault. Thus in part I we shall seek to place Lansley’s proposed ‘reforms’ of the NHS in the historical context. We shall therefore give a detailed historical account and analysis of the attempts to drive the NHS to market over the past thirty years. In 1948 the Conservative party had fully backed the vehement opposition of the British medical establishment to the Labour government’s proposals to set up the NHS. As a consequence, when the Tories won the 1951 general election it was widely feared that they would promptly put an end to ‘socialised medicine’ in Britain. However, in its three years of existence the NHS had not only proved highly popular, but, contrary to the predictions of many Conservative politicians, had also proved to be highly cost effective. As a result the Conservative governments of the 1950s came to accept, if rather begrudgingly at first, the NHS as an accomplished fact. By the 1960s most Tories’ attitudes had begun to move from begrudging acceptance to enthusiastic support of the NHS. In 1961 the notorious right wing Tory, Enoch Powell, was appointed secretary of state for health and promptly demonstrated his commitment to the NHS by announcing an unprecedented hospital building programme. From then on all, but a dwindling band of diehards on the extreme right of the Conservative party, defended the NHS. For most Tories the NHS was now viewed as a cherished and peculiarly British institution, which stood alongside the Royal Family and the BBC. Thus, when it came to the issue of health, all the major political parties had become ‘socialist’. With the economic and political crises of the 1970s this political consensus around the NHS began to be increasingly challenged from the fringes of both the left and the right of the political spectrum. For the old left the NHS fell far short of the vision of a socialist health service that had been originally put forward by the Socialist Medical Association in the 1930s, and which had inspired the creation of the NHS. First of all successive governments had underfunded the NHS. Second the compromises the post war Labour government had been obliged to make with the medical establishment in order to establish the NHS undermined its basic principles and distorted its priorities. Senior doctors and medical consultants had far too much power. Hospitals were run at the convenience of the hospital consultants, and as a result their private patients were given priority of treatment. Furthermore, dominance of the medical establishment meant that the more prestigious areas of medicine, such as heart surgery, were able to attract more resources leaving the less prestigious, such as mental health, underfunded. In addition to these old left criticisms there emerged the more ‘radical’ criticisms of the new left. Taking the provision of free health care for granted, these new left criticisms focused on the very theory and practice of modern medicine itself that the NHS served to entrench. Thus for example, they pointed out the persistence of Victorian ‘classist’ and ‘sexist’ attitudes in medical theory and practice; the rigid gender division of labour between ‘hard’ intellectual roles performed by male doctors and the ‘soft’ caring roles performed by mainly female nurses. They contrasted the analytical illness-focused approach of conventional medical science available on the NHS to the holistic and hence more patient-focused approach of alternative and non-western medicine that was rigorously excluded from the NHS. On the right, the small band of die hard Tories were now being bolstered by the pioneers of what was to become known as neoliberalism, which were now gaining a toehold in the economic departments of the universities and filling up the newly emergent right wing think tanks. For these free market ideologues the NHS was certainly an anathema, which defied all the principles and assumptions of the free market. Employing over one million people, the NHS was the largest employer in Europe, and second in the world only to the Chinese People’s Liberation Army. As such, for the free market ideologues it could only be characterised as a huge Stalinist bureaucratic monolith, which by definition must be inefficient. Armed with the theorems developed by the new sub-discipline of health economics, which purported to prove how the market in health care could be both equitable and efficient, they advocated sweeping away the NHS. Following Margaret Thatcher’s decisive victory in the 1979 general election these free market ideologues could hope to have their proposals put into practice. Thatcher though, however much she may have been sympathetic to the nostrums of the free market ideologues in ‘theory’, was above all a practical politician. It was clear that any move to radically reform the NHS, let alone any attempt to dismantle it, faced almost insurmountable problems. First of all there was the prevailing opinion within the established health policy making circles, made up of senior civil servants, government advisors, senior NHS managers and prestigious independent ‘experts’ drawn from both the medical professions and academia, that the NHS not only provided health care comparable to any other health system in the world, but did so very cheaply. It certainly would not be easy to convince this weighty opinion, backed up as it was by substantial empirical evidence, of the veracity of the abstract theories of the upstart free market ideologues. Second there was the formidable obstacle of the overwhelming support for the NHS on the part of the medical professions. The conservative medical establishment, which had vehemently opposed Bevan’s original proposals for establishing the NHS thirty years before, had now long passed into retirement. Most medical professionals had now spent their entire careers working within the NHS system. They had come to value the provision of universal health care as an integrated public service because it allowed them to practice their vocation as medical practitioners without heed to the financial means of their patients. They also had come to value the NHS for providing them with a comprehensive system of medical training and a guaranteed job and career structure for those who graduated on nationally agreed pay and conditions. Thus the vast majority of doctors, nurses and other medical professionals, and most importantly the highly influential organisations such as the BMA and Royal Colleges of surgeons, physicians and nurses which represented them, were stout and vocal supporters of the NHS and the principles on which it had been founded. Third there was the problem of the unionised and increasingly militant hospital work force that could be expected to mobilize against any major reforms that would threaten the NHS and their position within it. The militant strongholds within the hospitals had been the porters, cleaners and other non-medical auxiliary workers. But the nurses’ strikes of 1974 and 1979 and the industrial action taken by junior doctors in 1975 had shown that what at the time could be seen as a general tendency towards the ‘proletarianisation’ of the lower ranks of the professions had in the NHS resulted in the spread of militancy to medical professionals and a growing solidarity between both medical and non-medical hospital workers. Yet it was not just miners that were sympathetic to nurses and the NHS that they epitomised, but Thatcher’s ‘own people’. As the grocer’s daughter from Grantham no doubt knew more keenly than many of the toffs in her cabinet, the lower middle classes might defend the ‘right to go private’ in order to jump the waiting list for minor treatments, but when it came to serious ailments and major operations they were dependent on the NHS. They knew only too well that a more US-style health care system would leave them paying far more in private insurance than they would gain in any tax savings. Finally, even if it had been possible to overcome the formidable opposition that would almost certainly have arisen against any attempt to dismantle Britain’s socialised health care system, there was the very real problem that there was no immediate alternative that could take the place of the NHS. Following the establishment of the NHS the private health care industry had been reduced to playing a rather marginal role, and had become largely parasitic on the NHS. Shortly before the establishment of the NHS, seventeen of the main ‘non-profit’ provident associations that had up until then provided medical insurance had joined forces to form British United Provident Association (BUPA). As a result BUPA obtained a near monopoly in the provision of private medical insurance in the UK. By the late 1970s BUPA was providing 1.5 million medical insurance policies that covered around 6% of the British population. In the 1970s BUPA also began building and running their own network of private hospitals. But even these handful of hospitals mostly specialised in simple routine operations and treatments. Indeed, when any complications arose their private patients were, as they still are, usually rushed off to the nearest NHS hospital. Private health care was largely delivered by senior medical consultants working out of NHS hospitals. The 1948 compromise between Bevan and the medical establishment had allowed senior consultants to continue to carry out private work in addition to working for the NHS. Most medical consultants were thereby able to supplement their wages paid by the NHS by charging fees to their private patients. But most of these private patients were treated in NHS hospitals using NHS facilities and nursing care. Thus private health care was not only relatively small compared to the NHS, which provided health care to the vast majority of the British population - including many who had private medical insurance – but was also largely dependent on both NHS doctors and nurses and NHS hospital facilities. With the NHS committed to giving equal access to the best medical treatment available regardless of ability to pay, the principal advantage of ‘going private’ was for the better off to jump the queue for treatment. Thus it was certainly in the interests of both BUPA and senior medical consultants that the NHS should be underfunded, since this would result in longer waiting lists thereby making ‘going private’ more attractive. But being so dependent on the NHS it was not in their interests to go as far as undermining the NHS. The ‘private health care industry’ was therefore neither willing nor able to replace the NHS. In the face of such formidable problems Thatcher had little interest in ‘radically reforming’, let alone dismantling the NHS when she first came into office. If she was to ‘roll back the state’ Thatcher recognised that it was first necessary to break the power of organised labour. This was achieved only with the decisive defeat of the miners in her second term, after forcing up unemployment to levels not seen since the 1930s through the resolute implementation of monetarist economic policies, and the introduction of draconian anti-strike laws. Even then, it must be remembered, large parts of industry were in public ownership. Airlines, car manufacturers, steel plants, telecommunications, were prior candidates for privatisation. Then there were the great utilities of gas, water and electricity before she could get round to privatising public services like health and education that could only be considered in a programme for a distant third or fourth term that might never happen. It is true that in her first term in office Thatcher raised prescription charges. But, as she could point out, prescription charges had originally been introduced by the Labour Party in 1951 and had been reintroduced following the sterling crisis in 1967 after which their value had been rapidly eroded by the high inflation rates of the 1970s. Thatcher could claim that by raising prescription charges she was merely restoring their value. Furthermore, by retaining the various exceptions, which exempted the old, the long term sick and those on means tested benefits from paying the increased charges, the impact of this measure was limited. Indeed, the increased charge did little to raise income for the NHS or deter demand for its services and was largely a political gesture. More significantly, it is also true that in her first term Thatcher shifted the responsibilities of the NHS for the long term care of the elderly on to local authorities.10 This allowed for the subsequent introduction of ‘hotel charges’ for those who were deemed to have sufficient assets to pay - without being seen to impinge on the NHS principle that those in receipt of health care should not pay ‘hotel charges’ for their stay in hospital or other institution. This was to mean that the growing numbers of elderly who had become homeowners during their working lives were to find that they were required to sell their homes if they needed to enter old people’s care homes. As we shall see, it also, eventually paved the way for the privatisation of old people’s homes. Yet beyond these changes Thatcher in her early years trod very warily with respect to the NHS. Indeed, in retrospect, it might be said that the NHS was treated relatively favourably under Thatcher. Nevertheless, the NHS was not to be entirely exempted from Thatcher’s over-riding imperative to curb the remorseless growth in public spending. For Thatcher, if the NHS was to remain - at least for the time being - a universal and comprehensive public service, free at the point of use, then it would have to become more efficient and cost effective. As the Tories have subsequently been keen to point out, it is true, that, apart from the financial year 1983-4, spending on the NHS continued to grow substantially faster than the general rate of inflation. Indeed, both during Thatcher’s eleven years in office and under the subsequent Tory Government of John Major in the 1990s, there was a substantial increase in expenditure on the NHS in ‘real terms’. However, with the general rate of wages in the economy as a whole rising faster than the general rate of prices, and with little scope for increasing ‘productivity’, the NHS, like other labour intensive public services at this time, faced costs rising faster than the general rate of inflation. Furthermore, an aging population and advances in medical treatments meant that the NHS had had to meet an ever increasing demand if it was to provide a universal and comprehensive service. As a result expenditure on the NHS had to grow considerably faster than the general rate of inflation just to stand still. In her first three years in power Thatcher had stuck more or less to the previous Labour government’s plans for increased spending on the NHS, which had aimed to restore some of the cuts that had been imposed under pressure from the IMF following the sterling crisis in 1976. However, the NHS was not to be entirely exempt from the general austerity measures aimed at curbing public spending that were first trailed in Geoffrey Howe’s notorious 1981 budget. As a consequence, between 1983 and 1988 spending on the NHS was reined back. Although spending for the most part still grew in real terms during this period, it was far from sufficient to keep pace with growing demand. There therefore arose an increasingly severe financial squeeze on the NHS. It was secondary health care – that is mainly hospitals - that was to bear the brunt of the drive to curb rising costs. Hospital boards were stuffed with businessmen who were expected to provide a more ‘cost focused’ oversight on the running of hospitals. Hospital managers were given cash limited budgets and were expected to make year on year ‘efficiency savings’. At the same time, like elsewhere in the public sector, the government drove a hard bargain in the national pay negotiations for hospital staff. However, with the day-to-day running of hospitals still largely in the hands of senior medical consultants and senior nurses, the scope for managers to increase efficiency through changing long established working practices was limited. Better use of resources could bring some savings, but by far the biggest item of cost was the wage bill. But with wage levels set nationally the only way for hospital managers to trim the wage bill was to reduce staffing levels. Chronic staff shortages began to lead to the closure of wards and in some cases entire hospitals. Hospital workers, particularly nurses, were obliged to work harder to make up for the lack of staff and waiting lists began to seriously lengthen. All this was then compounded as the recession of the early 1980s gave way to the mid-1980s boom. Up until the 1970s nursing had been one of the few careers open to women. This was now rapidly changing. As unemployment fell, the low pay of nurses combined with their deteriorating working conditions meant that it was increasingly difficult to recruit young nurses or retain old ones even when where there was money available to pay them. Managers had to resort to more expensive agency nurses that cut further into their restricted budgets.11 By 1988 this squeeze on the NHS budget had reached crisis point. As early as 1983, following industrial action taken by ancillary hospital workers the previous year, Thatcher had introduced the process for the competitive tendering of hospital cleaning, laundry and other auxiliary services.12 Yet it had only been after the defeat of the miners in 1985 that the government began in earnest to press hospital managements to implement competitive tendering as a means of cutting costs. As a result 1987 had seen a number of strikes by hospital workers across the country. Then, at the beginning of 1988, thirty eight night shift nurses went on wildcat strike against understaffing and low pay in Manchester. Within weeks an avalanche of strikes, protests and demonstrations had swept across the country involving tens of thousands of every category of NHS staff, from doctors and nurses to clerical and ancillary workers. This wave of strikes and protests incited solidarity action from other workers. Car workers at Vauxhall car plant in Ellesmere Port, dockers at the Royal Dockyard at Rosyth and oil workers in Inverness among others came out on strike to support the national days of action that were called by the health unions. This wave of wildcat strikes in the NHS became part of a much wider strike wave in the winter of 1988, which included car workers, seamen, miners and teachers. For a few weeks it seemed that the class demoralisation that had followed the defeat of the miners had come to an end. Little more than six months before, Thatcher had triumphantly won her third election, and had appointed the hard line right winger John Moore as secretary of state for health to maintain the financial squeeze on the NHS. Now, in the face of mass opposition, Thatcher was forced on to the back foot. As means of buying time she was obliged to make an impromptu announcement of a review of the NHS. For the neo-liberal right wing minority in the Tory party who were opposed to ‘socialised medicine’, it was now clear that simply slowly bleeding the NHS to death by squeezing its budget in the hope that more people would opt out and ‘go private’ had reached a dead end. John Moore and other right wingers in the cabinet urged that the time had come for more radical measures to finance the NHS such as greatly increased health charges, the introduction of a national health insurance scheme or tax breaks for those who opted for private health insurance and health care. These measures were soon ruled out. It was recognised that not only would they be far too costly but given the mass protests and strike action in defence of the NHS that had prompted the review they would be unfeasible without a major confrontation with the working class.13 Instead, John Moore was sacked and the NHS was to be given an unprecedented increase in its funding over the following four years. However, foreshadowing what was to occur ten years later, in return for this substantial and sustained increase in funding there were to be major reforms to the NHS. Firstly the scope of NHS care was to be further reduced with the transfer of the responsibility for the long term care of the mentally ill to local authorities. This allowed for the closure and sell off of the large mental hospitals, along with their often spacious grounds, as mental patients were transferred to ‘care in the community’. At the same time, local authorities were obliged to contract out the long term care of the elderly to privately run nursing homes. This opened up a whole new market for private nursing care. Secondly, the programme of tendering out ancillary services of hospital was to be continued but nurses’ pay was to be re-graded as part of a move to transform nursing into a ‘modern profession’. This facilitated what was to become a growing split within hospital workers between re-professionalised nurses and an increasingly casualised and temporary work force employed by private contractors. Thirdly, and perhaps most importantly given subsequent NHS reforms that were to occur under New Labour, was the planned introduction of an ‘internal market’. The NHS was to be split between those parts that provided health services and those parts that were to purchase such services. The idea being that by introducing a ‘shadow market’ those responsible for running the NHS could be made to become far more cost conscious when taking decisions concerning the delivery and provision of health care. Following their nationalisation in 1948, hospitals had been subject to directives from the rather distant Department of Health in Whitehall and the regional health authorities, and had been overseen by lay members appointed to the various health and hospital boards. But, as we have already mentioned, much of the day-to-day running of hospitals was determined by the senior medical consultants. As far as the senior consultants were concerned, hospital managers were largely seen as subordinates, who were responsible for undertaking the rather tiresome tasks of doing the necessary paper work and keeping the books. As a consequence, when decisions were to be made financial considerations were often a poor third after both the medical concerns and the convenience of the senior hospital doctors. Furthermore the funding of hospitals had been through a block grant based on the historic running costs adjusted for any increase in services agreed with the Department of Health or the regional or local health authorities. This made it difficult for managers to asign the costs of providing particular operations or medical treatments and thereby draw proposals for cost savings. With the introduction of the ‘internal market’ hospitals, and other ‘secondary health care providers’, in each town or district were to be grouped together into NHS Trusts. The consequent new layer of NHS Trust managers placed immediately above the long established hospital administrators served to strengthen the position of management over and against that of the medical professionals. In addition the funding of the hospital trusts were to be based at least in part on treatments and operations they performed - that is on what they ‘sold’. By putting a costing on the provision of each particular health service and treatments it was hoped to make managers and medical staff more aware of the costs and efficiency of their delivery. On the ‘purchase’ side, instead of the Department of Health paying hospitals directly, GPs and local health authorities were to be given funds to ‘buy’ health services. Local health authorities would buy collective services for their area, such as the provision of accident and emergency services; while GPs would ‘buy’ individual operations and treatments on behalf of their patients from the hospitals and other ‘secondary care providers’ and ‘pay’ for the drugs they prescribed.14 This, it was argued, would make GPs in particular far more conscious of the costs of health care. They would no longer be simply free to refer their patients for any treatment that they thought best but would have to have some regard to the cost. However, the attempt to implement an ‘internal market’ into the NHS proved to be a failure both economically and politically. Whatever gains there may have been in terms of controlling costs by strengthening the hands of management and making GPs and hospital staff more cost conscious were more than outweighed by the costs incurred by the ‘internal market’ itself. Firstly, as we have seen, the introduction of the ‘internal market’ required a whole new layer of administrators to run the new hospital trusts. Secondly, far more importantly the purchaser-provider split involved substantial transaction costs as a vast array of health services had to be priced and invoiced. As a result administration costs more than doubled from less than 6% to 12% of NHS spending. This was further compounded by the gradual introduction of GP fund holding. The government’s proposals to introduce GP fund holding, which was central to the introduction of the ‘internal market’, had met with fierce opposition on the part of the BMA and many GPs. The BMA rightly saw the proposals as compromising the relation between GPs and their patients, since they would no longer be able to make referrals entirely on the basis of clinical need. They also saw GP fund-holding as a means of shifting the responsibility of the government’s underfunding of the NHS on to the shoulders of GPs. To overcome the resistance of the BMA the government sought to appeal over its head to individual GPs. GPs were to be allowed to opt into the system. To entice GPs to come on board they were to be allowed to keep part of the unspent budget to ‘improve their practice’s facilities’, which could of course be easily siphoned off into the doctor’s bank account if they were so inclined. In addition to this bribe to GPs opting in, the government had to ensure that fund-holding GPs had sufficient funds to avoid the politically embarrassing event of them running out of money due to some unforeseen increase in demand for health care from their patients. Furthermore, there were the considerable administrative costs to the NHS of running a dual payment system – one for GPs that were fund-holders and one for those that were non-fund-holders – until all GPs could be persuaded to opt-in to the system. As a result, the attempt to introduce GP fund-holding proved to be a highly expensive experiment. This was at a time when the NHS was once again being starved of cash as part of the severe austerity measures that were being imposed following Black Monday and the sterling crisis of 1992. Amidst growing waiting lists, the accusations that patients of GP fund-holders were being giving preferential treatment became a major political issue that was to contribute to Labour’s landslide election victory in 1997. As in the 1950s, there had been a rather begrudging acceptance of the NHS by the Tory governments under both Thatcher and Major. Funding of the NHS was kept tight for much of the eighteen years of Tory rule. With transfer of responsibility for the long term care of the mentally ill and the elderly transferred to local authorities the scope of the NHS was significantly reduced. The later Tory governments also oversaw the beginning of the decline of NHS dentistry, as parsimonious contracts prompted more dentists to opt out of the NHS and dental charges were increased. Yet during these years of Tory rule the founding principles of the NHS remained largely intact. Although ancillary hospital services were contracted out to private companies, the line was clearly drawn at medical services. The NHS remained predominantly a universal public service provided on the basis of clinical need not ability to pay and funded out of general taxation. Neither Thatcher nor John Major was prepared to make any unprecedented breaches to these founding principles. As we shall now see, it was to be left to the Labour party – the ‘party of the NHS’ to cross these red lines. In 1997 the NHS was once again reaching a critical state. The tight controls over spending following Black Monday in 1992, exacerbated by the introduction of the ‘internal market’, had once again seen the NHS becoming increasingly understaffed and overstretched. Waiting lists were growing to the point where waiting times for non-emergency operations of months if not years had become the norm. It was now becoming even more evident than in 1988 that the NHS was in a rapidly deteriorating condition that would have to be addressed sooner rather than later. The hospital building programme that had been originally launched by Enoch Powell in the early 1960s had been abruptly brought to a halt by the economic crisis of the late 1970s. As a result, as Britain approached the 21st century, there was still a large number of NHS hospitals that had been built before the first world war. Furthermore, cutting maintenance budgets had always been the first resort for hospital managers desperate to cut costs during the repeated periods of austerity over the previous twenty years. As a result many of Britain’s hospitals were not only outdated, expensive to run and unsuited to the needs of modern medicine, but also increasingly dilapidated. The poor state of the NHS had begun once again to raise the issue within the ruling class of its future. The general retreat of working class militancy and solidarity that had occurred over the previous ten years meant that the prospect of a repeat of the widespread strikes and protest actions in defence of the NHS were now significantly less likely than in 1988, although they still could not be entirely ruled out. As the BMA’s opposition to the ‘internal market’ had recently shown, the medical professions and their organisations remained committed to the NHS and willing and able to take collective action to defend its basic principles. Furthermore, the NHS, despite its dire condition, remained a cherished and popular institution amongst the general public. Any attempt to overtly radically reform, let alone dismantle the NHS, was still likely to face formidable opposition. It was true that the numbers of people covered by private medical insurance had more than doubled since Thatcher had first come into office, and there had been a significant growth in the number of private hospitals, but the UK health care industry still remained marginal and largely parasitic on the NHS. However, although the UK private health care industry remained limited and unable to provide a realistic alternative to the NHS, the 1990s witnessed the emergence of a global health care industry. Increasingly mainly American-based transnational health care corporations were now already beginning to eye up Europe, and particularly Britain as possible lucrative markets for expansion. Fuelled by the growing concerns at the poor state of the NHS, the well- funded ideological outriders of this emergent global health care industry began to develop what was in effect a two-pronged attempt to take over the established policy-making circles. The first prong was to embolden the Conservative right to demand the outright privatisation of health care in Britain and the reduction of the NHS to being merely a second rate safety net service for the poor. In addition to the usual arguments concerning the inherent inefficiency of publicly provided services, they reinvigorated the old Conservative argument that the demand for health care was unlimited. Either demand had to be limited through price or it had to be rationed through waiting lists. Thus, however much money was poured into the NHS demand, unlimited by price, would inevitably grow leading to ever increasing waiting lists. At the same time as urging the Tory right to assault the citadels of the policy-making establishment from the outside, these well-funded ideologues also posed as friends of the NHS from the inside. These Grima Wormtongues advised that, although it might be possible to stump up some money to allow the NHS to muddle through for the time being, the day was fast approaching when increasingly demanding middle class consumers would be persuaded to opt out of the NHS and ‘go private’. The middle classes would then become increasingly less willing to pay the taxes necessary to sustain the NHS. The NHS would then go in to terminal decline. If the NHS was to survive it would have to be radically reformed. Such advice chimed well with the ‘third way’ nostrums of Tony Blair and New Labour. The state of the NHS became one of the key issues of the 1997 election campaign and the Labour party had made it clear that saving the NHS would be one its top priorities. As one of its five pledges, included on its key ‘pledge card’ issued during the election campaign, the Labour party undertook to: ‘cut NHS waiting lists by treating an extra 100,000 patients as a first step by releasing £100m saved from NHS red tape’. However, on taking office it became clear that beyond this rather minimal pledge, the Labour government had little idea of what to do with the NHS apart from muddling through. Frank Dobson, the amiable old Labourite, who had to be found a place in government as a reward for aligning himself with New Labour, was appointed secretary of state for health as a reliable and reassuring pair of hands. Dobson promptly abolished GP fund-holding, but significantly retained the purchaser-provider split of the ‘internal market’ by merely transferring GP ‘funds’ back to the local health authorities. Beyond this Dobson’s hands were tied through lack of funds. New Labour’s commitment made at the election not to raise income tax for the first term in office and to stick to the overall government spending that had pencilled in by the previous government for the first two years of the new term of office, meant that there was little money to go round. Any increase in spending on health had to come from other government departments. As a consequence, although spending on the NHS did increase in New Labour’s first two years, and a significant amount of funds were released by scrapping GP fund-holding, there was still barely sufficient extra money to prevent matters from becoming worse. By the end of 1999 the largely self imposed squeeze on the government’s finances had begun to ease. Dobson was shunted off to fight the election for the mayor of London and was replaced by the once erstwhile far leftist and now zealous convert to New Labour – Alan Milburn. At the beginning of 2000 a particularly bad flu epidemic pushed the NHS into yet another ‘winter crisis’. The scandal of an acute shortage of hospital beds with people being treated on trolleys in corridors provided Tony Blair with an opportunity to make a dramatic and unexpected public announcement on TV. It soon became clear that this announcement was more than one of his usual PR exercises merely designed to defuse the immediate impact of bad publicity through a flurry of cosmetic policy initiatives. Indeed it amounted to a transformational shift in policy regarding the NHS. Blair announced that over the next ten years spending on the NHS would be raised to the average level of spending in the major European countries. This implied a commitment to provide a huge increase in spending on the NHS. Indeed, NHS spending would have to rise from less than 6% to more than 9% of GDP. ‘Saving the NHS’ or fattening it up for the market? Whatever else may be said about Tony Blair he was certainly true to his word over increasing the funding of the NHS. The unprecedented period of uninterrupted economic growth, which saw steadily rising tax revenues, boosted by a 1p in the pound increase in the rate of national insurance, provided the funds for Blair to meet his target of raising NHS spending to levels comparable with other western European countries. As a result, by 2010 there were 79,000 more nurses and 27,000 more doctors working for the NHS than ten years before. The number of operations performed increased from 5.7 million in 1997 to 9.7 million. The NHS also underwent the biggest hospital building programme in its history. All this allowed for the reduction of maximum waiting times for non-emergency operations and treatments to fall from two years to little more than 12 weeks, and for most of the other key indicators of the performance of the NHS to rise to levels comparable to anywhere else in the world. For senior NHS managers and planners, who had for years been restricted by the overriding imperative of keeping within tight annual budgets, the flood of extra funding opened up exciting opportunities for long overdue improvements in the way health services could be provided. For NHS staff, the extra funding also allowed for a series of generous pay settlements, particularly for those on higher grades, and a radical restructuring and harmonisation of pay scales across the NHS. The hiring of more nurses and nursing assistants greatly facilitated the acceleration of the transformation of nursing into a ‘modern profession’, which for years had up until then been held back by a lack of money. More nurses allowed nurses to specialise, and with more nursing assistants nurses could be divested of more menial tasks so they could undertake duties that had previously been the reserve of doctors. Within the new pay scales those who developed specialist skills could expect to be rewarded with a clearer and more rapid career progression. Yet all this came at a price. The NHS was to become the practical proving ground of Blair’s, up until then rather vague, ‘third way’. Invoking the threat of the anti-NHS lobby, Blair insisted that if vast amounts of government money were going to be poured into the NHS then it would have to modernise in order to make it more attractive to the middle classes. Patients would have to be treated more like consumers and given more ‘choice’. The NHS would have to become far more ‘innovative’ and ‘flexible’ to meet the needs of the ‘modern 21st century consumer’. For Blair, if such modernisation of the NHS was to be achieved it would have to be prepared to harness the more ‘customer- orientated’ skills of the private sector, and the NHS itself would have to become far more business-like. The long-standing demand from the left that the NHS should be fully funded would at last be granted; but this had to come with a more ‘market- orientated’ NHS and greater private sector involvement that had long been demanded by the right. The old Labour ‘shibboleth’ - that the private sector provision of health care was inimical to the basic principles of the NHS - would have to be discarded. Following Blair’s announcement at the beginning of 2000, Milburn was set the task of drawing up the ‘vision statement’ for the transformation of the NHS that would begin in earnest after the general election of 2001. This was published as the NHS Plan later in the year. Milburn’s Health Plan talked much about harnessing the private sector in order to improve the NHS and the need to make health services more patient focused by providing patient choice. However, the overriding imperative in what we will term New Labour’s first phase of NHS reforms was the need to show tangible results. Blair had feared that by making a commitment to greatly increase the funding of the NHS he would soon find himself under attack from the Tory press for pouring ‘tax payers’ money down a bottomless pit’ if it did not produce demonstrable results quickly. As a result, as the flow of funds began to increase, there was a proliferation of targets issued to NHS managers to ensure resources were concentrated into areas that could produce improvements in the performance of the NHS that were both measurable and politically significant. Yet this overriding need to produce tangible results also shaped both the introduction of reforms and private sector involvement in the NHS that were introduced in this period. Indeed, for all of Milburn’s talk of a modern more consumer-orientated NHS the need to build hospitals and reduce waiting lists became the primary justification for harnessing the private sector. Given the dilapidated condition of the NHS, there was nothing more tangible for the general public which demonstrated the government’s commitment to the improvement and modernisation of the health service, than the opening of a brand new hospital. Even before Blair’s announcement of extra funding for the NHS, the New Labour government had begun to involve private capital through the Private Financial Initiatives (PFIs) to build hospitals. With the surge in NHS funding PFIs became the principal way of funding what was to become an unprecedented hospital building programme. PFI had originally been introduced under John Major’s government in 1992. Traditionally public construction projects such as the building of schools and hospitals had been financed directly by borrowing money from the financial markets by the selling of government bonds. The money raised would then be used to pay construction firms to carry out the building work. Under PFI, consortia – usually consisting of financial and construction companies would be set up in order to raise the necessary finance and to carry out the building work. The government would then rent the buildings for a contracted period of time – usually between twenty to thirty years. In most cases the consortia would also manage the buildings and ensure their maintenance during this contracted period. They would then receive a management fee in addition to the rent. Advocates of PFI argued that it had distinct advantages over the traditional means of carrying out public construction projects for the government. First of all, the financial risks, such as any cost overruns that often bedevil major construction works, would be transferred from the public authorities to the consortia undertaking the work. Secondly, because the projects would be put out to competitive tender, competition between the different consortia seeking to win each contract would drive down costs. Thirdly, costs would be further reduced by the inherently greater efficiency of the private sector in managing and carrying out major construction projects. Forming a consortium and then submitting a complex bid, involving not only the construction of a school or hospital but also the subsequent leasing agreements - with all the expensive legal expertise this would entail – was necessarily a costly and lengthy process. But the costs of making a bid could only be recouped if the consortium actually won the contract. With a competitive tendering process often involving three, four or perhaps five consortia, the chances were that the time, money and effort required to make any one particular bid would be wasted. The private sector was therefore reluctant to become involved in PFI schemes unless there was some guarantee that; firstly, there would be a steady stream of similar PFI projects, so if they missed out on one there would be another contract coming along soon, and secondly, that when they did win a contract they would be sure to make a killing so as to make up for the ones they had missed. However, following Black Monday there was simply not the money available to ensure a steady stream of public construction projects. Thus under John Major, PFI had failed to take off. Haunted by the history of previous Labour governments being derailed by hostile financial markets, Gordon Brown had long been determined to placate the City from the very moment he assumed office as Chancellor of the Exchequer. As a consequence, his first act as Chancellor was to announce that he was handing over day to day control over monetary policy to the Bank of England. This was an act that had long been advocated by financiers and orthodox economists, but which had been strenuously resisted by previous Conservative chancellors, reluctant to give up control over politically sensitive interest rates. Brown then announced two golden rules that would govern his fiscal policy. The first golden rule was based on the principle that the government should pay for current expenditure out of current tax revenues, not by borrowing money. Instead, government borrowing should be used to finance ‘capital’ expenditure; that is to pay for the construction of social and economic infrastructure such as roads, schools and hospitals. However, Brown was too much of a Keynesian to insist on a rigid adherence to a balanced budget, which would require sharp cuts in public expenditure if tax revenues fell due an economic downturn. Thus his first golden rule specified that the government should cover current spending by current tax revenues over the course of an economic cycle. This golden rule certainly provided some reassurance for the financial markets concerning Brown’s commitment to pursue a prudent fiscal regime. However, it was recognised that there was ample room for him to fudge, since it depended crucially on what Brown would define as the duration of any particular ‘business cycle’. Furthermore, by itself this first golden rule provided no limits to what Brown might borrow in order to finance what he might deem ‘necessary public investment’. It therefore had to be supplemented a second and far more rigid golden rule. This second golden rule was a commitment that government debt should not exceed 40% of GDP. Yet such efforts to placate the City conflicted with New Labour’s commitment to address the problem of the dilapidated state of much of Britain’s social and economic infrastructure following twenty years of chronic underinvestment. How could the government find the money to build new schools and hospitals when it was committed to reducing government debt? PFI provided a clever wheeze to resolve this dilemma. Because under PFI public works were financed by the private sector the money spent on them did not count as government debt. Indeed, since the government in effect ended up renting buildings from the private sector, PFI transferred the government’s ‘capital’ expenditure to the ‘current spending’ side of its ledger. For the first two years there had still been little scope for setting up PFI projects since the New Labour government was committed to the previous government’s plans to reduce overall government expenditure. However, as the economy boomed and tax revenues rose it became possible to use PFI to ‘leverage up’ the increase in revenues to finance major construction programmes without breaching Brown’s second golden rule. Thus after 1999 PFIs had begun to take off. Following Blair’s decision to prioritise the NHS, PFIs became the principal means of financing the unprecedented hospital building programme. However, it soon became clear that the arguments of the well-paid advocates of PFIs were seriously flawed. The argument was that there would be a cost saving in the long run if investment was made by private companies rather than government spending. But any investment would obviously incur interest rates, and even more obviously the government could always borrow at far lower interest rates than any company, since the risk of it defaulting on its debts was negligible. Any cost savings that would result from the supposedly greater efficiency of the private sector, due to competition or due to the transfer of risk, were dwarfed by the greater financial costs of raising money through PFI and the need to ensure the private consortia made ‘an adequate profit’. As has now become widely recognised, PFIs proved to be a very bad deal.15 With the government insisting that PFI was the only means of financing the construction of new hospitals, hospital trusts found themselves having to pay several times the cost of a new hospital over the course of the twenty or thirty year deal, at the end of which the buildings would belong to the private consortium. Yet despite the fact that PFI proved to be a very expensive way of financing the hospital construction programme, it allowed Gordon Brown to appease the financial markets by sticking to the letter of his golden rules. The City of course was prepared to turn a blind eye to such creative accounting because many financial firms were able to make a killing out of it. PFI proved to be a handsome bribe to the City that allowed the New Labour government to show that it was rebuilding the NHS without upsetting the financiers. PFI meant that the private sector was now far more closely involved in the management of the NHS through the ownership and maintenance of a substantial number of hospitals. Yet this involvement still stopped short of actually providing clinical care. It was the political imperative of reducing waiting times that provided the justification for crossing this all important ‘red line’. PFI schemes may have allowed New Labour to quickly deliver tangible and concrete results in the form of the brand new hospitals, but they did little to meet the equally politically important imperative to reduce waiting times for those needing NHS treatment. Most of the new hospitals simply replaced old hospitals. Because PFI was so expensive hospital trusts usually had to settle for new hospitals that had significantly fewer beds than the hospitals that they replaced. Thus, other things being equal, hospitals built through PFI schemes tended to reduce the capacity of the NHS. For Alan Milburn the drive to reduce waiting lists could only be done by breaking the ‘taboo’ of private sector involvement in the provision of NHS-funded health care. In 2000, with great publicity, he signed a ‘concordat’ with the main private hospitals for the NHS to use their spare capacity. In accordance with this concordat, Primary Care Trusts (PCTs), which were now the NHS bodies responsible for ‘commissioning’ health care, would be permitted to buy hospital care for NHS patients from the private sector. In another highly publicised initiative Milburn granted permission for PCTs to send NHS patients abroad for treatment in order to reduce waiting times. Yet despite all the fanfare about such initiatives their impact on reducing waiting lists was negligible. The number of patients treated in private hospitals or sent abroad for treatment never amounted to more than a few thousand. Far more significant for reducing waiting lists was the launch of the first wave of Independent Sector Treatment Centres (ISTCs). In the months running up to the 2001 election and immediately after it, Blair and Milburn made a point of stressing that the vast increase in funding for the NHS would have to be accompanied by the ‘reform’ and ‘modernisation’ of the NHS. Yet despite a flurry of initiatives and policy announcements such ‘modernisation’ and ‘reform’ did not seem to amount to much. By 2003, with Blair embroiled in waging war on Iraq, and Milburn facing increasing opposition from Gordon Brown and the more sceptical members of the cabinet, it appeared that the drive towards reforming the NHS by increasing private sector involvement in actual provision of health care had run out of steam. Indeed, in the financial year of 2003/4, when the first wave of ISTCs had begun to come on stream, the private sector provided merely 0.07% of NHS operations and medical treatments. For many the increased involvement of the private sector in the NHS, whether in the form of PFI schemes or through the direct provision of health care, may have seemed a small price to pay to secure new modern hospitals and the substantial and unprecedented increase in funding of the NHS. After all, the NHS remained largely intact. Those on the left that continued to warn that the changes that had been pushed through, although small, were merely the thin edge of the wedge could be dismissed as nostalgic old socialist ideologues that were resistant to any change. Indeed, as it became clear that the transformation in the NHS was being brought about by increased funding rather than by private sector involvement, it could be hoped that Blair’s and Milburn’s insistence on ‘radically reforming’ the NHS would be forgotten as a passing fad. This seemed to be confirmed by Milburn’s unexpected resignation as secretary of state for health in the summer of 2003. The main problem facing the NHS at this time, particularly for those working in it, seemed to be more the rapid profusion of often conflicting targets and the almost continual administrative reorganisations imposed by the the government, rather than ‘privatisation’. Yet this view proved to be rather complacent. It underestimated the powerful interests both within and outside the government that were pressing for the prising open of the health service to health capital, the implications of organisational changes already set in train by Alan Milburn and the significance of the precedents that had been set with private sector involvement in the provision of health care within the NHS. Indeed, in what we shall term the second phase of New Labour’s reforms, there was to a renewed and far more vigorous impetus in pushing through not only greater private sector involvement but also the radical organisational changes in the NHS over the next few years. In the first phase of New Labour’s reforms, the private sector involvement in the provision of NHS health care had been both driven and justified by the need to show rapid results. As such it had been based on the principle of ‘additionality’ – that it was confined to providing additional capacity to that of the NHS. Now, in the second phase, the driving principle for private sector involvement was to become ‘contestability’ – that is the private sector was to be brought in to compete with the public provision that threatened to transform the very nature of the NHS. With the passing of the Health and Social Care Act in the autumn of 2003, which provided the legal basis for the introduction of ‘foundation status’ for Hospital Trusts, it became clear that Dr. John Reid, the new secretary of state for health and close ally of Tony Blair, had taken up the baton of radical reform from Alan Milburn. In 2004 there was a blizzard of announcements and policy initiatives that were to be continued and implemented under Patricia Hewitt – the subsequent secretary of state for health - following the general election in 2005. These initiatives put forward a wide range of reforms, each of which had its own distinct ostensible rationale – such as ‘patient choice’, ‘improved patient access to health care facilities’, the ‘introduction of competition’ or ‘improved efficiency’ – but which together could be seen as interconnected moves towards creating what has been described as a ‘managed market’ in health care. The vision of a ‘managed market’ in health care – whose outlines with hindsight could now be clearly discerned in Milburn’s NHS Plan of 2000 – was to harness the forces of the market and competition in the delivery of health care services. The basic principle of the NHS, that there should be the provision of universal and comprehensive health care free at the point of use, would be preserved. But the delivery of health care as an integrated nationally- run public service was to be replaced by regionally based ‘mixed health economies’ made up of both publicly and privately owned ‘health care providers’. As with the original plan for the ‘internal market’, GP fund-holding would be reintroduced under the New Labour label of ‘practice-based commissioning’. GPs would be given budgets with which they would be able to ‘commission’ or buy health care on behalf of their patients. However, unlike the arrangements of the old ‘internal market’, GPs would be able to buy health care from a wide range of approved health care providers, either inside or outside the NHS. Charities, co-operatives of former NHS staff, private companies as well as publicly owned NHS Trusts could all seek approval to compete to sell their health care services. To prevent universal standards of health care being undermined through price competition, the Department of Health would draw up a comprehensive list of prices or ‘tariffs’ for each type of treatment available. Competition between providers would therefore be based on ‘quality of treatment’ not price, and each provider would be paid a set amount for the ‘episodes treatment’ they performed. Money would then ‘follow the patient’, allowing those providers offering a better service to customers to prosper. By going beyond the ‘internal market’, and opening up the provision of health care to a broad range of providers, it was argued that the creation of a ‘mixed economy’ in health care provision would serve to increase ‘patient choice’ and allow for more ‘innovative’ and ‘patient focused’ ways to deliver health services. It was also argued that, unlike the old ‘internal market’, it would introduce real competition between providers, which would serve to increase efficiency, drive down costs and drive up the quality of treatment. Yet it was acknowledged that simply letting loose market competition in the provision of health care could have serious disadvantages as well as advantages. The market-based delivery of health care had to be not only strictly regulated, but also managed and planned if it was to be harnessed to provide comprehensive health service available to all. Each of the ten regional ‘health economies’ would therefore be managed by a Strategic Health Authority (SHA), which, as a state agency, would be directly responsible to the Department of Health. SHAs would be responsible for ensuring the planning and provision of universal and comprehensive health care in their regions by commissioning the building and maintenance of the necessary health care facilities and franchising them out to the various health care providers and overseeing health care providers and PCTs. At a local level, PCTs would be retained. They would distribute funds to GPs in their area, and would oversee and provide general administrative support for the practice-based commissioning process. They would also be responsible for commissioning health services not covered by GP-commissioning and for ensuring the co-ordination of the delivery of health care with the social care provided by local councils. At a national level, the secretary of state for health would not only hold the purse strings, but would also retain extensive powers to intervene in the operation of the regional health markets to ensure the provision of a comprehensive and universal health service. The secretary of state would also retain the power to appoint various semi-autonomous bodies made up of ‘experts’ to oversee the maintenance of national standards of health care, administration and medical and staff training. Of course it was one thing to have a broad vision of replacing the NHS with a ‘managed market’, but it was quite another to realise this vision. If nothing else, the organisational and institutional changes necessary for the introduction of a ‘managed market’ were formidable tasks and could not be achieved overnight. The NHS as an integrated public service would have to be broken up into competing commercial organisations, market mechanisms would have to be put in place and there would have to be a huge increase in private sector involvement. All this would certainly require a prolonged period of transition. Alan Milburn already had initiated many of the preparatory steps that were to provide the basis for the introduction of the ‘managed market’, but in order to not arouse unnecessary opposition from the trade unions and the medical professions he had trod warily and with much stealth. But it was becoming clear that if New Labour was to really transform the NHS into a ‘managed market’ the time was fast approaching where Blair and his allies would have to break cover. Firstly, any radical changes were most likely to succeed if they could be wrapped as part of schemes to improve the delivery of health care. But most of such improvements cost money. By 2008, the target of raising NHS spending to 9% of GDP would have been achieved, after which there would be far less extra money to spend on funding the costs of further radical improvements and ‘market reforms’. Secondly, Blair’s pledge not to fight a fourth election meant that he would have to hand over the reins of power to Gordon Brown well before 2010. Although Brown was a co-architect of New Labour and the ‘third way’, and as such was far from looking unfavourably on the principle of ‘NHS reform’, it was not one of his top priorities. He could not be counted on to drive through the changes necessary to create a ‘managed market’ in health care, particularly as this was ‘Blair’s baby’. Thirdly, the establishment of a ‘managed market’ required large scale private sector involvement. Only the transnational corporations had the resources and capital to provide such private sector involvement on a large enough scale, but they needed a clear commitment from the New Labour government that they were serious about ‘reform’. They had to be assured that if they were to commit large amounts of capital the New Labour government would not get cold feet if the going got tough. They could not be expected to wait forever while New Labour said one thing covertly to them and another thing publicly to the trade unions, the medical professions and the general public. Thus, after a brief pause following Milburn’s resignation, it was decided to go for it. Hence under Reid, and then Hewitt, the drive towards the introduction of a ‘managed market’ was openly accelerated. As a result, it soon became clear that New Labour’s aim was that by the following general election most of the elements necessary for the transition to a ‘managed market’ would be in place, and that the momentum of ‘reform’ would have become irreversible. The initial focus of the surge of reforms that followed the general election of 2005 was putting in place the three main pillars necessary for the creation of a ‘managed market’ in secondary health care. The first of these was the transformation of the existing NHS trusts that provided secondary and specialist health care into independent commercial enterprises. The second pillar was the transformation of patients into health ‘consumers’ guided by their GPs. The third pillar was the expansion of private sector involvement in the delivery of secondary health care in order to create a competitive market. If NHS hospital trusts were to become ‘health care providers’ competing both with each other and with other non-publically owned ‘health care providers’, then it was necessary that they all became distinct commercial enterprises. First of all this meant that they had to be incorporated as distinct legal entities. Secondly they had to become financially independent, with no hidden government subsidies and with financial systems and controls that could cope with variations in income due to changes in market share. In early 2002 Alan Milburn had announced his intention to allow better performing NHS hospital trusts to gain independence from the Department of Health by obtaining a new independent legal status as ‘Foundation Trusts’. At the time Milburn presented ‘Foundation Trust’ status as an option that would not only give hospital trusts greater freedom to run their own affairs, but would also increase local accountability since patients and local residents could be involved in the running of the trust. At the same time, it could also be seen as a means to raise standards. For managers of NHS hospital trusts beset by the proliferation of targets and directives issued by the Department of Health, the prospect of greater operational autonomy certainly offered a tempting incentive to achieve the required ‘star ratings’ that were needed before a trust could begin the process of becoming a ‘Foundation Trust’. In 2002 Milburn had also introduced a new financial regime for NHS hospital trusts. First of all there was the introduction of what was termed ‘Resource Allocation Budgeting’ (RAB) - that was in fact to apply to all public services. This had two important implications for NHS hospital trusts. The first was that it prevented hospital trusts raiding their capital accounts – the money set aside to pay for maintenance, new buildings and equipment – to cover deficits on the their revenue account – the money that was required to pay day to day expenses like wages, medicines etc. This, it was argued, made the accounting of hospital trusts far more transparent. Second, whereas previously if a hospital trust ran out of money it was able to go cap in hand to its Strategic Health Authorities (SHAs) and be given the money necessary to make up the short fall, under RAB any such payments would in effect be a loan that would have to be paid back at the end of the next financial year. This stipulation meant that NHS trusts had to be far more careful in their financial management. If they ran up a deficit in one year not only would they have to cut costs sufficiently to eliminate the deficit next year, but also to pay off the ‘debt’ they had incurred to the SHA. If they failed to do this they would face mounting 'debts’. The NHS hospital trusts would therefore be under pressure to at least break even on a year to year basis. The second important element in the new financial regime was the shift away from cost to tariff-based payments to hospital trusts for the health services they provided. As we have seen, following the demise of GP fund-holding, the commissioning of health care had reverted back to the local District Health Authorities, which had subsequently been replaced by PCTs. As a result every year PCTs drew up service contracts with their local hospital trusts for the delivery of a specified amount of health services that were to be performed by the hospital trusts for all the patients referred to them by GPs in the PCT’s area. The PCTs then paid the hospital trust the costs of performing the specified number of operations and treatments. Of course, with a ‘managed market’ system, it was envisaged that all ‘health providers’ were to be paid out of the funds held by the GP referring each patient. The amount paid by the GP would then be based on the nationally set tariff for each particular ‘episode of treatment’ that the ‘health provider’ performed for the patient. However, Milburn had been reluctant to make the same mistake as had been made ten years before and rush in the logistically complex and politically sensitive system of ‘practice-based commissioning’ or GP fund-holding. Nevertheless hospital trusts had to be prepared to shift from payment according to costs incurred to payment according to the national tariff if they were to be ready to become ‘health providers’ competing in the managed market. As a result, in late 2002 the Department of Health had set forth its proposals to replace the annual contracts between PCTs and hospital trusts with Service Level Agreements (SLAs). SLAs would be specified in far greater detail than the previous contracts and be based on the nationally set tariffs, rather than on the actual costs incurred by the hospital trust in performing the ‘episodes of treatment’. The introduction of SLAs - combined with the introduction of the new financial regime and the pressure on trusts to break even year on year - was presented as a means to leveraging up the efficiency and cost effectiveness of hospital trusts. Now that their principal source of income was determined by the tariffs paid for the treatments they performed rather than the actual costs they incurred, ‘inefficient’ and therefore high cost hospitals would soon find themselves running up serious deficits. They would then be obliged to become more efficient in providing their health services in order to reduce the costs they incurred in performing operations and treatments to the levels indicated by the national tariffs set by the Department of Health. Following the passing of the Health and Social Care Act of 2003 it was announced that all NHS Trusts were to be expected to achieve ‘Foundation Trust’ status by 2008. It now became evident that the new financial regime and the introduction of SLAs was not merely a means of leveraging up the cost effectiveness and efficiency in the NHS, but were vital steps towards placing hospital trusts on an independent financial footing that would be necessary if they were to become commercially independent Foundation Trusts. Yet Patricia Hewitt faced a formidable problem if she was to hurry NHS trusts and PCTs to become ready for the market in little more than three years time. Nearly a third of all NHS hospital trusts were facing mounting debts and were far from being in a financially sustainable position to acquire Foundation status. Although the remaining two thirds of NHS hospital trusts were financially stable they lacked the financial controls and accounting procedures necessary to cope with variations in the demand for their services they would face in a competitive market as they won or lost market share. But this was not all. If the basis for the ‘managed market’ was to be put in place in the next three years it was also necessary to push through ‘practiced-based commissioning’. This would require PCTs also to be in financial balance so that they could then devolve their commissioning budgets to GP practices without any debts. Yet PCTs had also been subject to RAB accounting and nearly a third of them were also facing mounting debt. Faced with the constant stream of directives and performance targets issued by the Department of Health most NHS managers, whether in NHS trusts or in the PCTs, had tended to see financial issues as a low priority, particularly at a time when money was flooding into the NHS. As a result, as a means to force through the necessary changes that would be required both to transform hospital trusts into fully independent commercial enterprises and to force PCTs to devolve their budgets to GPs by the end of the decade, Hewitt precipitated an artificial financial crisis. Under Milburn NHS trusts had come to expect that so long as they gave sufficiently convincing assurances that attempts were being made to reduce costs, any debts they had run up due to deficits incurred in previous years would be rolled over by their SHA. Debts to the SHA could be considered as merely nominal indicators highlighting where there may be a need for cost containment. As such they could be subordinated to other more pressing concerns and priorities. Indeed, many hospital trusts could reasonably argue that they had higher than average costs, and hence mounting debts, not because they were particularly inefficient, but because of the legacy of the past. Some hospital trusts still had old Victorian buildings that were expensive to heat and maintain. These trusts also often had hospitals split between different sites that imposed further costs incurred in the transportation of patients and staff, as well as for communication. At the other extreme there were trusts that had brand new hospital buildings, which were concentrated on one site and efficient to heat and maintain, but which had been built using an expensive PFI scheme that saddled them with high annual payments. In addition the government’s policy of shifting resources towards Labour’s heartlands in the old industrial cities of the north – which, it was argued not without considerable justification, had been severely neglected during eighteen years of Tory rule – meant that many PCTs in the south were left short of money. As a result many of these PCTs found they lacked the money to pay for a sufficient number of operations to enable hospitals to meet the government’s ambitious targets for reducing waiting lists. This meant that either the PCT spent more money than it had, or the NHS hospital trusts had to perform more operations than were specified – and hence paid for - in the SLAs drawn up with their local PCTs. Hence either the PCTs or NHS trusts or more usually both - ended up out pocket and ultimately in debt to the SHA. At the beginning of 2005 Patricia Hewitt announced that by the end of the 2006-7 financial year the total overspend would have to be eliminated and all PCTs and NHS trusts would have to have reached the point where their monthly accounts were in balance. Furthermore, within three to five years all debts to the SHA were to be paid back in full, and all NHS trusts were to have financial controls and accounting procedures necessary for commercial viability in place. To this end, all those NHS trusts and PCTs that were in financial difficulties would be set tough financial targets by their SHA. To meet these targets NHS trusts would be expected to set up ‘turnaround teams’, which would include both senior managers and management consultants drafted in from one of the four major auditing companies to provide financial expertise, in order to identify where cost savings could be made and to drive them through. At the same time, those PCTs that were in surplus were ‘top sliced’, that is they had to hand back a proportion of their surplus to the Department of Health, and SHAs were ordered to set aside a proportion of their budget as a contingency reserve, thereby further squeezing the amount of money they could dole out to PCTs and NHS trusts. This requirement that SHAs set aside a contingency reserve meant that no sooner than they had issued tough financial targets to their indebted NHS Trusts and PCTs than they had to issue more stringent targets. The financial crisis for these NHS trusts and PCTs was thereby intensified. By the autumn it became clear that many NHS hospital trusts would not be able to meet their financial targets by the end of the year. The only way they could possibly meet their targets would be through large scale redundancies but this would require 90 days consultation with the trade unions concerned. By the time the redundancies could be made the money saved by a reduced wage bill before the end of the financial year would be more than offset by the redundancy payments that would have to be paid out. Then, at the beginning of 2007 Hewitt relented. The money saved up through ‘top slicing’ surplus PCTs and the contingency reserves of the SHAs were released. The indebted PCTs and NHS trusts were brought back from the brink. However, precipitating a financial crisis not only served as a means to force through changes necessary to make NHS trusts commercially viable, it also served as a means to hasten the introduction of ‘practice-based commissioning’. Facing the prospect of having to push through large scale redundancies NHS hospital trusts could be expected to press PCTs for payment for all the operations they had actually performed, rather than those specified in SLAs. They would themselves be led to demand ‘payment by results’. But PCTs, themselves strapped for cash, had little control over the numbers of patients referred to the hospital trusts for treatment by GPs. Their obvious way out would be to devolve the responsibility for ‘buying’ operations and specialist medical treatment from NHS trusts down to GPs. PCTs would therefore be led to push through ‘practice-based commissioning’ under pressure from NHS trusts. A ‘managed market’ needed patients to act like health consumers. To encourage and to facilitate this transformation of patients into consumers, the government introduced what became known as the ‘Choose and Book’ system of referrals. Up until the introduction of the ‘internal market’ in the 1990s, GPs had, in principle, been able to refer patients anywhere in the NHS. In practice the vast majority of referrals for specialist treatment were to the local hospital. This was because the GPs usually knew the consultants personally and because the patient wanted to be treated near to where they, and their friends and relatives, lived. But for the market ideologues this meant that the local hospital trusts had in effect a ‘local monopoly’ in the provision of secondary health care. If the ‘managed market’ was to work, patients had to be made to act as consumers. They had to be given a choice of where they would be treated, whether they liked it or not. Thus in 2003 the IT companies Atos Health Care and Cerner signed a lucrative contract with the Department for Health to develop the ‘Choose and Book’ computer-based referral system. With ‘Choose and Book’ patients would be able to arrange with their GP when and where they could go for treatment and then book an appointment there and then. By 2005 the system was ready to be rolled out across the country’s GP surgeries. However, in order to encourage the development of the ‘managed market’, Patricia Hewitt stipulated that where possible there should be five options available to choose from, and at least one option should be for a non-NHS provider. In order to create a competitive ‘managed market’ it was necessary to break up the monopoly position of the existing NHS hospital trusts. The quickest way of expanding the range of ‘health care providers’ necessary to create a competitive market - and provide the patient choice necessary for the ‘Choose and Book’ system to work - was to greatly extend the number of ISTCs, which had already proved to be attractive propositions to the transnational health corporations. As we have seen, the introduction of the first wave of ISTCs had been based on the principle of additionality. However, for the second wave, restrictions on the use of NHS staff and resources were removed. ISTCs were now to directly compete with NHS hospitals. As a consequence, whereas the first wave of ISTCs provided fast track routine operations in those types of surgery where there were bottlenecks in NHS provision, the new ISTCs were to provide a far wider range of both surgical operations and medical treatments. Although a second and further wave of ISTCs provided an immediate way of introducing competition, there were longer term plans to unbundle secondary care services that would allow further opportunities for greater private sector involvement. These took the form of a drive towards the ‘reconfiguration’ of hospital services. In 2005, under the rubric of ‘Best Care, Best Place’, consultations were launched by PCTs across the country to consider proposals to shift various hospital services into the ‘community’. There had for many years been a considerable weight of opinion within both health and social policy circles that far too many medical treatments were conducted in hospitals and that it would in many cases be far better to treat people closer to their own homes. This was particularly the case for old people who often found it distressing to go into a large and impersonal hospital that was often some distance away from their homes. Previously the relocation of services had been inhibited by the extra costs that that would involve. But with more money available it had now become possible. By opening up alternatives to hospital-based health care, ‘Best Care, Best Place’ was broadly welcomed. However, at the same time it also opened up opportunities for non-public providers of health care. Indeed through the consultation process much was made of the possibility of charities and other non-profit organisations being offered the chance to bid for the provision of the new services. In 2007 a further wave of consultations was launched under the rubric of ‘Fit for the Future’, which, as we shall see later, was to prove far more controversial than its forerunner ‘Best Care, Best Place’. It had long been argued that it would be far more economical and produce better health outcomes if some of the more specialised and complex hospital services were to be concentrated in a smaller number of hospitals. For some specialist services, it was argued, many district general hospitals did not have a large enough catchment area to provide a sufficient flow of patients necessary for medical teams to develop their specialist skills or to justify their costs. This was particularly the case with accident and emergency services. The introduction of modern well equipped ambulances, manned with highly trained paramedics, meant that the condition of patients could be stabilised at the scene of the emergency or accident. The time taken for the ambulance to reach an accident and emergency department was therefore far less critical than it had once been. ‘Fit for the Future’ consultations therefore proposed a major reconfiguration of hospital services. Firstly, it was proposed that a few highly specialised centres, providing a tertiary level of health care, would be established in each region. Secondly, in each area or county a significant number of district general hospitals were to be downgraded to the status of ‘Community Hospitals’, with their accident and emergency and other specialist departments transferred to neighbouring district general hospitals. Whatever merits such proposals had in terms of improving the delivery of certain health services, they also provided an opportunity for greater private sector involvement. The newly created community hospital offered a far more attractive proposition for the transnational health corporations than the old- style district general hospitals with their public obligations to provide non-profitable services such as accident and emergency departments. ‘Fit for the Future’ could therefore be seen as a means of preparing the way for the eventual large scale privatisation of NHS hospitals. With these moves towards the creation of a ‘managed market’ in the provision of secondary care up and running, the focus of NHS reform began to shift towards increasing private sector involvement in the provision of primary care. One of the problems that had beset the NHS throughout its existence had been that, because they had remained self-employed contractors to the NHS, GPs had retained considerable discretion as to where they located their practices. This had meant it had been often difficult to ensure an equitable distribution of primary care services and in many poorer areas there was a serious shortage of GP practices. Ostensibly to overcome this problem, the government announced that it was to invite health corporations to set up GP practices, and in May 2006 the first contract was signed for Care UK to set up a ‘walk-in centre’ in Dagenham. Yet as the government sought to encourage more GP practices to be set up or taken over it became increasingly clear that the professed aim of providing a more equitable provision of primary care came second to the drive to increase ‘competition’ and private sector involvement. In December 2006 Professor Ara Darzi, a leading surgeon with extensive experience in health policy, was appointed to draw up proposals for the reconfiguration of health care provision in London. One of the central proposals of his report published six months later was the introduction of polyclinics. The idea of polyclinics in each neighbourhood, that would group together 30 or more GPs to provide a wide range of health care services, had been central to the vision of a national health service put forward by the Socialist Medical Association in the 1930s. However, it had been successfully blocked by GPs at the time of the founding of the NHS. Yet while the original vision had seen polytechnics as being publically owned and run, the New Labour government now saw them as a means to further privatise the provision of health care. The idea of privately run polyclinics was then extended to the rest of the country. In 2008 Richard Branson announced that his new business Virgin Healthcare was planning a chain of ‘Virgin’ large health care clinics or polyclinics and launched his own consultation exercise inviting GPs to hear his proposals. Later that year it was announced that all PCTs would have to open one polyclinic in their area. However, as we shall see, already by 2008 the drive towards creating a ‘managed market’ was rapidly running out of steam. Branson abandoned his plans for the establishment of a chain of health clinics and the proposals for polyclinics in London and elsewhere were substantially scaled back. In June 2007 Blair was obliged rather reluctantly to resign as prime minister. Gordon Brown promptly replaced Patricia Hewitt with the more pragmatic Alan Johnson as secretary of state for health. In the autumn, before Johnson even had time to settle in as secretary of state, came the onset of the economic crisis in the autumn of 2007 ‘Reform of the NHS’ rapidly slipped down the government’s agenda. Yet even before the departure of Blair and Hewitt the momentum towards a ‘managed market’ had begun to falter. The transition towards a ‘managed market’ was never presented as a coherent worked out programme, which then sought to win general consent. Instead, as we have mentioned, ‘reform’ was to be driven through by an endless blizzard of apparently disconnected policy initiatives, each of which had its own distinct ostensible rationale aimed at ‘improving’ or ‘modernising’ the NHS. This approach had certain advantages when it came to overcoming potential opposition. Firstly, the constant stream of initiatives coming from the Department of Health - some of which were simply abandoned or revised after a couple of months - served to overwhelm opponents of the privatisation and marketisation of the NHS. No sooner had opposition begun to mount against one policy initiative in one area then another one was announced elsewhere. Secondly, because the ‘market’ and private sector involvement were presented as merely the most efficient means to achieve some particular objectives necessary to modernise and improve the NHS, any opponents to the changes could easily be marginalised as dyed-in-the-wool conservatives blocking necessary change. Furthermore, focusing on the often undeniable desirability of the ostensible objectives of the reform served to obscure the wood for the trees. The expansion of private sector involvement and the introduction of market mechanisms might well seem harmless means to achieve certain particular ends but this only served to obscure the broader implications that that these might have if they became the dominant means to meeting the ends of the NHS. Thirdly and perhaps most importantly, there was the sheer momentum of the reforms. Permanent reform, driven through in an atmosphere of crisis, however apparently chaotic and incoherent to those obliged to carry it out, made any opposition appear as futile. Indeed, the main option increasingly taken by medical professionals and other NHS staff was to stoically attempt to work around the often contradictory dictats coming out from Whitehall. Although the BMA, the Royal College of Nurses and the NHS trade unions were often highly critical of the expansion of the private sector involvement, the commercialisation of the operation of NHS trusts and the introduction of market mechanisms, they were reluctant to rock the boat. After all the government was still pouring in unprecedented sums of money into the NHS and they had been fully involved in negotiating the ‘Agenda for Change’ that introduced the radical and generous re-grading of the national pay, conditions and career structures for medical professionals and other NHS staff. Although there were a few sporadic strikes and protests these were soon closed down and any opposition rapidly demobilised by the professional organisations and trade union of the NHS in favour of politely lobbying the government. Indeed, the main popular protests to emerge against New Labour’s changes were not against privatisation or marketisation at all. They arose against the proposals for the reconfiguration of hospitals put forward in the ‘Fit for the Future’ consultations. The prospect of their long cherished local hospital being downgraded, or even closed down entirely, was sufficient to bring tens of thousands of people out on to the streets across the market and commuter towns of south east England throughout 2007 and 2008. Eager to demonstrate that the Tory party had changed and was now fully behind the NHS, David Cameron, the new leader of the Conservative Party, encouraged local Tory politicians to throw their lot in with the campaigns to save the hospitals under threat. Faced with such opposition the government was forced into a retreat on many of the ‘Fit for Future’ proposals. Yet, while it may have dampened New Labour’s enthusiasm for reform, such political and popular opposition cannot be credited with the ultimate failure of New Labour’s attempt to transform the NHS into a ‘managed market’. The process of ‘reform’ ran out steam not because of any concerted opposition but because of both the chaotic process of reform itself and the contradictions in the very vision of a ‘managed market’. This apparently pragmatic statement, however, was always based on the unquestionable ideological presumption that what worked best was the private sector. But this presumption was to prove to be false. Indeed private sector health care proved unable to compete with existing NHS institutions. The failure of this crucial element in the construction of a ‘managed market’ undermined the entire process of ‘market reform’ in the NHS. The central pillar necessary to create the basis for a ‘managed market’ was a dramatic increase in the private sector’s involvement in providing secondary health care. An increase in private sector involvement, it could be argued, would both increase competition for the NHS hospital trusts – thereby obliging them to act as commercially orientated businesses – at the same time as providing increased ‘patient choice’. As we have seen, the quickest means of increasing the share of the private sector in the provision of secondary health care was to roll out further waves of ISTCs that would compete with the various services provided by NHS hospitals. Yet if ISTCs were to provide the means of creating a ‘managed market’ in secondary health care there had to be a huge expansion in both their numbers and the range of health care services they provided. At the time of launching the second wave of ISTCs John Reid had announced that they could eventually account for up to 15% of elective surgery. Patricia Hewitt subsequently upped the ante by making it clear that this 15% share was not a limit but a target, and that in principle there would be no limit to the amount of secondary health care provided by the private sector that would be paid for by the NHS. In order to entice the private sector to become involved in taking up the franchises to run ISTCs, the government was prepared to offer lucrative contracts. The companies taking up the franchises were not only to be paid by the local PCTs the NHS tariffs for the ‘episodes of treatment’ they were contracted to perform, but they would receive an extra 11% of the tariff as a bonus directly by the Department of Health. If this was not enough, the companies running the ISTCs would also be guaranteed that they would be paid the full amount for the number of operations they had signed up to provide whether they actually performed them or not! The ISTCs were also allowed to cherry pick the patients they accepted, so that they could perform the simpler and thus cheaper operations, leaving the more complex and more costly ones to the NHS hospitals. Yet although they were being paid over the odds, the performance of the ISTCs often proved to be abysmal. The numbers of operations actually performed in many cases fell far short of the amount that ITSCs had been contracted to carry out, and a significantly high proportion of those that were carried out were botched and had to be put right by the NHS hospitals. As a result the ISTCs proved to be a costly experiment. Facing growing criticisms that the contracts of the first and second wave of ISTCs had been far too generous the government announced that the contracts for future waves would no longer include the 11% bonus or the guarantee of payment regardless of whether contracted operations were performed or not. The ISTCs would therefore be expected to compete on a more level playing field with the NHS hospitals. As a result, rather surprisingly as far as the government was concerned, interest from the private sector in bidding for a third wave of ISTCs rapidly evaporated. The promise of a third wave was consequently soon forgotten. In 2008, as the contracts for the first wave came up for renewal, a number of ISTCs were taken back into the NHS. By 2010 little more than 2% of operations paid for by the NHS were being delivered by the private sector. The expansion of the ISTCs had proved to be a dismal failure. The failure of the programme to expand the number and variety of ISTCs had a knock on effect on the showcase for ‘patient choice’ - the ‘Choose and Book’ referral system. Like most if not all computer systems procured by the government, the ‘Choose and Book’ system provided by Atos Health Care and Cerner proved to be a bit of a pig in a poke. Not only was it beset by lengthy delays before it was fully implemented, when it did come in to operation it proved to be rather cumbersome to use. The average time taken to ‘choose and book’ an operation was often longer than the average time a GP had previously spent with a patient. Furthermore, the ‘choice’ offered was rather artificial with the obligatory five options offered often being made up with hospitals or treatment centres sixty or more miles away. This was in part due to the fact that the number and variety of ISTCs was limited. But it was also due to the nature of ISTC contracts. Because ISTCs were guaranteed payment for the total number of operations they had contracted to perform and could cherry-pick the sort of treatments they provided, PCTs sought to steer suitable patients towards ISTCs in order to ensure they got their money’s worth. Patients were as consequence ‘packaged up’ to provide what ISTCs wanted. ‘Patient choice’ therefore often meant in effect health providers choosing the patient rather than the other way round. As a consequence, GPs often sought to avoid the full rigmarole of going through the ‘Choose and Book’ system with their patients. Indeed, surveys where the ‘Choose and Book’ system was in operation suggested that most patients could not recall using the ‘Choose and Book’ with their GP. By 2008 virtually all hospital trusts had been expected to have become Foundation Trusts, and PCTs should have been well advanced in rolling out ‘practice-based commissioning’ and ‘Payment by Result’ systems. As it turned out, the New Labour government fell considerably short of these admittedly rather ambitious targets. In 2010 30% of NHS hospital trusts had yet to acquire legal status as ‘Foundation Trusts’ and nearly 10% had not yet even been placed on a sustainable financial footing. Furthermore, in most areas, PCTs were still lagging behind in rolling out ‘practice-based commissioning’ and ‘Payment by Result’ systems. The financial crisis precipitated by Patricia Hewitt had certainly focused the minds of NHS managers, even those in PCTs and NHS Trusts with a surplus who feared they may slip into the red if they were not too careful and face the predicament of their less fortunate colleagues. As a result most NHS trusts and PCTs saw a distinct improvement in the financial position. But it was a trick that could only work once before NHS managers recognised that it was in the end a bluff; and it was a trick that failed to address the very structural problems that many Trusts faced that could not be cured by simply finding ‘efficiency savings’. The financial crisis also led to calls by NHS trusts for ‘Payments by Results’ and also placed pressure on PCTs to introduce ‘practice-based commissioning’. But such financially induced pressures soon came up against the simple economic fact that ‘practice-based commissioning’ would inevitably cost PCTs, and indeed NHS trusts more. Firstly, by devolving much of their commissioning budget to GPs the PCTs might be able to reduce their administrative staff, but this would be more than offset by the fact that each of the hundred or so GP practices would have to be given more money so that they could hire accountants and administrators to deal with their transactions with NHS Trusts. At the same time NHS trusts would have to hire more administrators to deal with the numerous transactions with these hundreds of GP practices rather than with mainly one or two PCTs. Secondly, the number of patients belonging to an individual GP practice was far too small to cope with unexpected variations in demand. A serious chickenpox epidemic at the local primary school could easily plunge a GP practice into the red. To prevent such an occurrence GP-practices would have to be given flexible or soft budgets that then mitigated the very purpose of having the budgets in the first place. Yet even if these targets had been met the failure to expand private sector competition has meant that such changes would have ended up being more about form than substance. Even where Foundation Trusts exist and ‘Payment by Results’ is in operation the vast majority of NHS patients are still referred to their local hospital, and as such the local hospital trust still remains the ‘monopoly supplier’. Whether the money to pay for operations and treatments is routed via PCTs or GP practices, the hospital trust ends up with a more or less secure flow of funds with which to finance and plan its activities. Although NHS managers may now be well-versed in management speak, the relation between NHS bodies is still based far more on collaboration and co-operation than on competition. Indeed NHS trusts still see themselves as part of the NHS family – which may now include the odd private company – whose purpose is to provide an integrated public health service rather than a competitive market. As such, despite the fears many had that the surge of reforms after the 2005 general election would mean the end of the NHS as a public service now appeared as somewhat exaggerated. When all was said and done, the concerted attempt launched by Milburn and accelerated by Reid and Hewitt to move towards the introduction of a ‘managed market’ in health care has not shifted the NHS much beyond the old ‘internal market’. Indeed, in 2010 it had seemed that ‘market reforms’ had all but come to an end.19 But once again this was to underestimate the determination of the marketers that were to gain a fresh wind with the election of a Tory-led government. As we shall now see, while New Labour’s may have failed in its attempt to create a ‘managed market’ it has certainly paved the way for the Tories to attempt to break up the NHS and replace it with a ‘regulated market’. When David Cameron became leader of the Conservative party in 2005 he faced an uphill task. The Tory party had just suffered its third resounding election defeat. The Conservative party risked losing its position as the official opposition party to the Liberal Democrats and, with the average age of its members rising above 65, it faced the prospect of simply dying out. Unless Cameron succeeded in turning round its fortunes quickly, his party was heading for oblivion. Cameron’s immediate task was to ‘de-toxify the Tory brand’ and reinvent it as a modern more ‘socially aware’ party. Central to this re-branding exercise was to out flank the Labour party on the NHS. Cameron had to convince the middle of the road voters that the Conservative party had discarded the anti-public sector heritage of the Thatcher years and, as such, was no longer hostile to the NHS. To do this Cameron repeatedly presented himself as a devoted friend of the NHS - ever grateful for the care it had provided for his disabled son. He made clear that under a Conservative government the basic principles of the NHS would be preserved: health care provision would remain comprehensive, universal and free at the point of use. In the run up to the general election in 2010 Cameron further pledged that the NHS budget would be ring fenced and thereby spared from the swingeing cuts that would have to be imposed on all the other public services in order to reduce the government’s huge deficit. And, what is more, he promised that there would be no further ‘top-down’ reorganisations that had bedevilled the NHS during New Labour years in office. This promise not to impose any more ‘top-down’ reorganisations chimed with many of the prevalent concerns, particularly amongst medical professionals and NHS staff, concerning New Labour’s running of the health service. The prevalent complaint had not been so much about the increase in private sector involvement or the introduction of market mechanisms – after all as we have seen these developments in the end had proved to be rather limited – but the excessive interference in the day to day running of the health service on the part of the Department of Health. Medical professionals, as well as many NHS managers, had become tired and frustrated at the incessant stream of targets, directives and seemingly pointless administrative re-organisations coming out from Whitehall. There had therefore been a growing opinion, supported by many of those working in the NHS, that the government should take more of a back seat. The NHS should be, it was argued, ‘de-politicised’ and run more like an independent public corporation like the BBC. Of course, for many market reformers, this incessant government interference could be seen to have been necessary at the time to prepare the NHS for the ‘market’. But for the more radical market reformers, this process of ‘forced liberalisation’ through state direction could now be seen to have served its purpose. The basic elements of a market in health care are now almost in place. It is now possible to harness the widespread unpopularity of excessive state inference in the day to day running of the NHS that arose from this previous phase of forced liberalisation to push forward the process of ‘market reform’ that had become stalled under New Labour. But this would mean going far beyond the vision of a ‘managed market’ towards a form of a ‘regulated market’ akin to those that had been introduced in the water, electricity, and gas industries following their privatisation in the 1980s. It would also mean an upheaval in the health service not seen since 1948. Andrew Lansley had been the shadow secretary of state for health since 2004. During that time he had come round to the opinion that the ‘managed market’ had run out of steam. He had therefore begun working on plans to go beyond the ‘managed market’ and move towards a ‘regulated market’ in health care provision. Following the election in May 2010 Cameron duly appointed Lansley as secretary of state for health and gave him free rein to put his plans for ‘radically reforming the NHS’ into operation. Lansley did not waste time. By early autumn he had put forward his legislative proposals in a white paper and, after a cursory period of consultation, he submitted his Health and Social Care Bill to parliament in January 2011. Lansley’s proposals certainly went far beyond anything contained either in the Conservative party manifesto or the coalition agreement that had been signed with the Liberal Democrats only a few months previously. By rushing his proposals through with such haste, Lansley no doubt hoped that he could put them on the statute book before the radical upheaval that it would necessarily entail was recognised and opposition to his radical reforms could mount. In the name of reducing bureaucracy and Whitehall interference in the running of the NHS, Lansley’s Health and Social Care Bill proposes to abolish the command and control structures that under New Labour were supposed to ‘manage the market’ and harness forces of competition and private sector involvement in order to provide a comprehensive and universal health care service. SHAs and PCTs are to be swept away. At the same time, the powers and responsibilities of the secretary of state and the Department of Health to provide a national comprehensive and universal health service are to be significantly reduced. With the state no longer able to manage or significantly direct the health care system, GPs are to be put in the driving seat. GPs will be obliged to come together in ‘GP-led consortia’ that will be large enough to be both economically viable and able to bargain on equal terms with foundation trusts and other secondary health care providers. These ‘GP-led consortia’ will then be given state funds to commission health care for their patients and will be able to buy health care from ‘any willing and qualified provider’, whether they are from the public, private or charitable sector. An essential element of Lansley’s vision of a ‘regulated market’ is that there should be easy entry and exit of ‘health care providers’ in and out of health care markets. For Lansley this will allow competition and the discipline of the market to fully function. Not only will new providers be encouraged to enter the health market to increase competition, but existing ‘health providers’ will be allowed to go bust. Indeed, with the abolition of SHAs existing NHS hospital trusts in particular will no longer have the implicit guarantee that they will be bailed out if they find themselves in financial difficulties. Yet Lansley’s proposals do recognise that there cannot be a completely free market in the provision of health care. Like essential services such as the provision of water and electricity, the health market needs to be regulated. First of all there has to be a degree of co-ordination between ‘health providers’ to provide an efficient health service, the training of medical professionals and the diffusion of best practice and knowledge. Second there needs to be regulation ensuring that ‘health care providers’ provide high standards in their delivery of health care. Third there needs to be regulation to ensure fair competition between providers and to prevent monopoly practices. Fourthly, there has to be regulation and oversight of health providers’ financial affairs to ensure that services are not disrupted by making sure there is a smooth transfer of the management of health facilities if a health provider happens to go bankrupt. As a consequence, those regulatory functions that are currently performed by the Department of Health, SHAs and PCTs will be transferred to a complex web of semi-autonomous bodies. Some of these bodies already exist and will have their powers and responsibilities expanded. Thus, for example Monitor, which currently regulates foundation trusts, will have its remit expanded to oversee and regulate all ‘health providers’ and to approve new entrants to the health market. Others, such as the National Commissioning Board, which will take over responsibilities for commissioning major health facilities from SHAs and oversee the commissioning process of ‘GP-led consortia’, will have to be established. Of course it was soon pointed out that Cameron had promised that there would be no more ‘top-down reorganisations of the NHS’, but, although Lansley’s ‘reforms’ will certainly lead to further organisational upheaval on a scale far greater than anything attempted by New Labour, they were not so much a ‘top-down’ reorganisation, as a decapitation of the NHS, which amounts to nothing less than its effective de-nationalisation. Dismantling the NHS in order to ‘save it’! 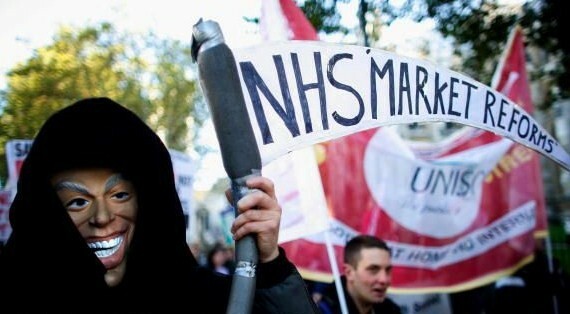 Like Milburn before him, Lansley has presented his ‘market reforms’ as a necessary means to ‘save the NHS’. He argues that if the health services are to remain comprehensive, universal and free at the point of use, at a time when demand is continuing to grow, then it is ‘necessary’ to harness the private sector and market forces to drive down costs. However, for Lansley, the problem of Milburn’s vision of a ‘managed market’ was that attempts to manage the market through direct state interference only served to inhibit the development of private sector involvement in the NHS, increased costly and inefficient bureaucracy and largely neutered the impact of competition and market forces in driving down costs. Although there must still be regulatory safeguards, Lansley insists that the private sector and market competition must be given far greater freedom to operate. Certainly Lansley’s reforms will open up the NHS to far greater private sector involvement and market competition. It is recognised that the vast majority of GPs will be neither willing nor able to take on the tasks of running GP-consortia. Lansley’s Bill therefore provides for GPs to outsource the administration of GP-consortia to private sector firms. Indeed, even before Lansley’s Health and Social Care Bill was submitted to parliament, major transnational health corporations, along with the snake oil merchants from the big four auditing companies, were moving in to help ‘advise’ GPs on the setting up of GP-consortia. It is seems likely that most, if not all, of the 600 or so GP-consortia that are expected to be established will end up being run and controlled by a handful of transnational health corporations. These transnational corporations will then have their mitts on the £60 billion budget for purchasing health care on behalf of patients. NHS foundation trusts will certainly face the prospect of far greater competition. First of all they will face the hard-headed businessmen running the GP-consortia who may be expected to drive a far harder bargain than the former PCTs in buying health care. The regulators are also required to encourage new health care providers to compete with the foundation trusts. These providers will be able to cherry-pick the more profitable routine operations and medical treatments leaving more costly and less profitable ones to the NHS trusts. Facing greater competition and the resulting loss of revenue - and no longer able to rely on being bailed out by their SHAs - the NHS trusts will face going bankrupt. They will then be taken over, either by private companies or other more financially successful NHS trusts. Indeed, already, it has recently been revealed, the government has been in negotiations with German health corporations to take over the running of twenty or so NHS hospital trusts that are in serious financial difficulties. However, in order to compensate for this increased competition from the private sector, foundation trusts are to be given far greater commercial freedom. They will have greater control over the disposal of their assets, such as land and buildings, and will be able to borrow money for investments from banks and other financial institutions. More significantly the caps on the number of private patients they are allowed to treat will be abolished. They will therefore no longer be constrained by the objective of treating NHS patients. Indeed, there are already suggestions that the more world renowned teaching hospitals will look to enter the lucrative global health market and specialise increasingly in treating the world’s super-rich. Therefore there is the prospect of most of the purchasing, and a significant proportion of the provision, of health care being taken over and run by the private sector, and in particular the major transnational health corporations. Not only this, facing commercially oriented consortia NHS trusts will have little option but to operate in a far more competitive and commercial way or go bankrupt. As a consequence, the collaboration of the ‘NHS family’ will be broken up and replaced by commercial competition. Yet while this all may turn out to be the case, Lansley’s assertion that greater private sector involvement and market competition, which will result from the introduction of a ‘regulated market’, is a means to ‘save the NHS’ is flawed. Far from reducing costs greater private sector involvement and more intense market competition will drive up the costs of providing health care. Furthermore, as the number of health care providers and purchasers increase the total number of transactions that need to be accounted for and invoiced will increase. Hence the total costs of administrating and regulating the ‘regulated market’ are likely to be far greater than they are at present. Perhaps more importantly, at present most agreements are between publically owned bodies and are not legally binding. Disputes between NHS organisations are usually settled within the ‘NHS family’ without resorting to the law courts. But as the regulated market becomes more competitive and dominated by the private sector corporations, expensive litigation to settle disputes or to renegotiate contracts will increasingly become prevalent. Along with the army of administrators and accountants necessary to run the market in health care there will also arise an army of very expensive lawyers. Of course, Lansley, like Milburn before him, will assert that the private sector is inherently more cost effective than the public sector. The pursuit of profit will serve to drive down costs, and competition will ensure that a large slice of these reductions in costs will be gained by the public purse through lower prices for the delivery of health care. But as we have seen with ISTCs this is not the case. ISTCs were simply unable to compete with NHS hospitals on costs. Why was this? Of course the notion that the private sector is somehow inherently more cost effective and efficient than public sector organisations is no more than ideological twaddle. But more than this, private sector involvement in the provision of health care has peculiar difficulties. The problem for private firms is that they have to make a return on the capital they advance. They have to make a profit for the benefit of their shareholders. This means that their costs are 10%-15% higher than their public sector competitors just to start with. Now of course in most industries, capitalists will seek to become more competitive by increasing the productivity of the labour they employ. They can do this either by making their workers work harder or longer, or else by introducing machines or a more productive organisation of the labour process. But all these means of increasing the productivity of labour depend on the capitalist having a degree of control over the labour process. However, the scope for such control is limited in health care, particularly when it comes to the labour process of medical professionals. If the scope for increasing productivity is limited then the alternative is to reduce costs. But health care is highly labour intensive. Most costs are wage costs. More efficient or innovative ways of counting the number of bandages that are used is not going to make much difference to the overall costs. The only way of making serious cost reductions is to cut the wage bill. However, as we have seen, in order to buy off opposition to his reforms, Milburn had, through the ‘Agenda for Change’, reaffirmed his commitment to nationally agreed pay and conditions for NHS staff. These nationally agreed pay and conditions were protected for all NHS staff being seconded to the private firms running the ISTCs. The only way of reducing the wage bill was therefore to reduce staffing levels but even here there is a limit since reductions in staffing levels soon effect the quality of health care. Thus far from driving costs down, increased private sector involvement and the further introduction of the ‘market’ will serve to drive up the costs of sustaining a universal and comprehensive health service that is free at the point of use. Under New Labour, rising government spending on health was sufficient to absorb the increased transaction costs brought about by the introduction of the ‘managed market’ and could pay for the lucrative bungs necessary to entice private sector involvement in the NHS. This will not be the case for Lansley’s proposed ‘regulated market’ in health care. Cameron may keep his promise to exempt the NHS from the current draconian spending cuts being imposed elsewhere in the public sector and maintain health spending in real terms over the next five years, but even if the NHS was to be left as it is, spending on the NHS would still need to grow by between 2% to 3% above the general rate of inflation merely to keep up with growing demand. Merely raising levels of spending in line with the general rate of inflation will result in a severe squeeze on the NHS not seen since the last Tory government. The cost of introducing Lansley’s will only further exacerbate this financial squeeze on the NHS. Yet it is through this very financial squeeze that Lansley hopes to push forward his market ‘reforms’. Whereas under New Labour the move to a ‘managed market’ was driven by political directives of the Department of Health, under the Tories the move to a ‘regulated market’ is to be driven by the blind economic necessities imposed by austerity. But for management reducing staffing levels is difficult. The easiest and least confrontational way is simply to freeze recruitment and not replace staff when they leave. But this is easier said than done since in a hospital there are numerous jobs that are essential and have to be filled sooner or later. Alternatively management can push through large scale redundancies but for highly paid medical staff that have worked most of their lives in the NHS this can be prohibitively expensive due to the high redundancy payments that have to be paid out. Thus pressure will then mount from foundation trust managers to have control over the pay and conditions of their own staff to give them ‘greater flexibility’ in reducing costs by reducing the level of wages and salaries. As a result the national structure of pay and conditions will come under pressure and, with a growing reserve army of unemployed NHS staff, the ability of both the medical professions and the health unions to defend it will be weakened. Once the national pay structure is broken the way will be open for private sector ‘health care providers’ to carve out a profit by ruthlessly under cutting the pay and conditions of the NHS trusts. Of course the alternative to reducing costs would be to find alternative sources of revenue. As we have mentioned a significant part of Lansley’s proposals is to lift the restrictions on the number of private patients NHS foundation trusts can treat. Foundation trust managers will soon argue that unless it takes drastic action to balance the books it will be taken over by a transnational corporation that will. The only alternative to cuts that might undermine the level of care for patients is to gain revenue from treating private patients. Foundation trusts will be driven to become the providers of private health care at the expense of providing a public health service. Instead of enticing the transnational health corporations into running GP-consortia by offering them lucrative government contracts, Lansley hopes to entice them by allowing them to develop profit-making opportunities. They will be able to offer treatments not available on the NHS, such as complimentary medicines. They will also be able to exploit the captive audience of patients to recommend various ‘health and beauty’ or ‘health and fitness’ products. GPs now facing the prospect of having to be collectively responsible for the consortia’s budget may well see this as a lesser evil than restricting or delaying patient referrals to balance the books. Of course it will not be long before the management of the GP-consortia pressure or offer inducements for GPs to offer patients the option, for a ‘small top up fee’, to go private in order to jump the growing NHS waiting list. This will be particularly the case where the companies running the GP consortia are also offering the private treatment. As more patients go private the demand for medical insurance to cover top up fees will grow, providing another source of profit for the transnational health corporations. As money remains tight due to the increased costs of the market and private sector involvement, pressure will mount to restrict the treatments available ‘on the NHS’. NHS treatment will be slowly reduced to what is deemed to be essential, everything else will have to be paid for. The principle that health services should be universal, comprehensive, free at the point of use and funded out of general taxation will become a thing of the past. As we have seen, under Thatcher those right wing Tories, who had hoped that starving the health service of funds would prompt the middle classes to sooner or later opt out of the NHS, had been thwarted by the stubborn fact that the private health care industry was too small and marginal to provide an adequate alternative. Now, thanks to New Labour, a potential private health care industry has been incubated within the NHS itself. However, whether Lansley’s drive to break up the NHS and re-commodify health care will be successful is still far from certain. At first Lansley’s attempt to push through his Health and Social Care Bill, before Cameron’s charm offensive over the NHS wore off and anyone noticed the full implications of this legislation, worked well. The opposition from the Labour party to the bill in the Commons was hampered by the fact that Lansley could claim he was simply extending the principles already established by the previous Labour government. However as the bill entered its final stages in the Commons in early March opposition had begun to mount. The main medical professional bodies, particularly the BMA and the Royal College of Nurses, and the NHS trade unions began voicing grave concerns at the implications of the bill. Even many of the more moderate pro-market reformers such as the King’s Fund began to express fears that Lansley’s proposals were going too far too fast. At the BMA conference a motion calling for non-co-operation with Lansley’s proposals was narrowly defeated. This prompted a rebellion of Liberal-Democrat delegates, already reeling from the flack they had taken for Clegg breaking his promise over tuition fees, at their spring conference. At the end of March, with even Norman Tebbit opposing the bill, and facing the prospect that Liberal-Democrat and cross bench peers would block the bill in the Lords, Cameron was obliged to step in and announce that he would take the unprecedented step of pausing the bill’s progress through parliament in order to hold a ‘listening exercise’. As a result, over one thousand amendments were made to the bill before it was sent to the Lords. Nevertheless, despite all the amendments, the basic principles of the bill remained in place. At the time of writing the bill is still making its way through the Lords. Although it is unlikely that the bill will be blocked, it is likely that further amendments that could blunt the bill’s impact could be introduced by the Lords. With time running out before the end of the parliamentary session, when the bill will have to have been passed by both Houses of Parliament or else fall, the government is unlikely to be able to overturn many of the Lords’ amendments when the bill returns to the House of Commons. However, the Health and Social Care Bill only lays the basis for the introduction of a ‘regulated market’. The drive towards a ‘regulated market’ depends on Lansley standing back and allowing blind economic necessity to do its work. This of course may allow Lansley to get away with denying responsibility for the unpopular outcomes of this process, since he can argue that they result from NHS managers and clinicians being ‘free to make their own decisions’. But then again, in the midst of a political furore over the closure of a hospital or of patients being denied NHS treatment such a denial of responsibility will be hard to sustain. Yet in such circumstances Lansley will have divested himself of most of his powers as secretary of state to intervene. If Lansley is obliged to take powers to intervene then he will undermine the transition to a ‘regulated market’. The transnational health corporations will only become involved in the running of GP-consortia and setting up ‘health providers’ if they are sure that the government is committed to opening up opportunities to make a profit by selling health care and ultimately medical insurance. If he is seen as backtracking then interest in becoming involved in the ‘regulated market’ may rapidly cool. Another serious danger for Lansley is losing the battle with NHS workers. An essential element in the transition to the ‘regulated market’ is the breakup of the national agreements governing the pay and conditions of NHS staff. This will require a potentially unpopular confrontation with the medical professions and the NHS trade unions. In such a confrontation Lansley will have nowhere to hide but will have to lead the charge. With the continued popularity of the NHS, particularly amongst Tory voters, Lansley’s attempt to introduce a ‘regulated health market’ at a time of austerity is certainly a high risk strategy. Lansley had no doubt hoped that before the next general election the transition to a ‘regulated market’ would be well on its way. But with the amendments to the Health and Social Care Bill that he has been obliged to concede, if political crisis dose not blow up, then it is quite possible that the transition will simply become bogged down. Thus for example the deadline for setting up GP-consortia by 2013 has been put back, making it likely that in some areas GP-consortia make take years to come into operation. At the same time, amendments to the bill to ensure collaboration in the delivery of health services such as the inclusion of hospital doctors and other clinicians in the commissioning process are likely to blunt the market competition necessary to drive into being a properly functioning ‘regulated market’. Hence it is quite possible that the Tories may have to retreat in the face of concerted opposition or else allow the reforms to run out of steam. Indeed, it is highly likely that Lansley’s reforms will result in an unstable half way house between an integrated public service, provided free at the point of use and funded out of general taxation, and a ‘regulated market’ funded in part by private medical insurance. Certainly the battle over the NHS is not over with the passing of the Health and Social Care Bill. Indeed it is likely to become a crucial political issue in the next few years. The attempts to drive the NHS to market has faced considerable obstacles over the past thirty years. Many of these obstacles are far less formidable than they once were. The days when workers across industry were prepared to take wildcat action in defence of the NHS now seem to belong to another world. In the NHS itself, militancy of nurses and other hospital workers has declined over the past twenty years. The militants that remain are isolated and are often fearful of putting their heads above the parapet, not only because they may risk losing their jobs, but also because they may be disciplined by their unions or professional bodies. There certainly has been a strong opposition on the part of a substantial minority of doctors to the attempts by both New Labour and the Tories to introduce the market into the NHS. But the majority of doctors remain indifferent, or at best passively opposed, and prefer to remain ‘non-political’. Furthermore, there is a significant minority of doctors, particularly GPs, who are keen to become ‘doctorpreneurs’ and see the potential of great profit from the introduction of the market. The BMA, the RCN and other professional organisations, along with the main NHS trade unions, such as Unison, Unite and the GMB, have become reluctant under New Labour to mobilise their members against government policy. Instead they have preferred to politely lobby the government on such political matters. This of course may change somewhat if the Tory government seeks to drive through changes to pensions and break up of national agreements on pay and conditions. Nevertheless the NHS remains a highly cherished institution that still retains overwhelming popular support. This support is for the most part passive. Most people are prepared to leave the complexity of health policy to the ‘experts’. But it remains a potentially explosive issue if handled badly. The drive to the market has therefore always to deny its true intention. Yet there remains one further obstacle and that is the fact that the NHS has proved to be a remarkably cost effective means of delivering health care. Why should the capitalist state destroy a system that is so cost effective? What is it that has been behind the drive to the market? Is it simply the irrationality of a free market ideology? Of course, ideology is an expression of material interests. As Colin Leys and Stewart Player have persuasively shown, since the early 1990s health policy making has been taken over by a small elite of lobbyist and politicians that have close links, and are in the pockets, of the transnational health corporations. As result, the drive to the market can be seen to be an example of state capture, where special interests take over the direction of state policy for their own ends against the interests of capital as a whole. Yet, how ever much we might accept this notion of state capture, it also true that the emergence of a global health care industry is relatively new. How far is it true that health care is becoming a site of capital accumulation, rather than as before merely some kind of faux frais of capital accumulation that is to be confined to the province of charity or the state? In part II we shall consider these issues in more detail. 1. Since the establishment of the Scottish Parliament and Welsh Assembly powers over the NHS in Scotland and Wales have been devolved. As a result the unlike the NHS in England the NHS in both Scotland and Wales has escaped the ‘drive to the market’. 2. “Noone could deny the relation between class and illness. To take the single most fundamental index, the infant death rate, it was in 1935 only 42 per thousand live births in the Home Counties, 63 in Glamorgan, 76 in Durham, 77 in Scotland, 92 in Sunderland and 114 in Jarrow… The results of the 2½ million examinations of young men completed in the last year of the first world war showed that of every nine men, only three were fit and healthy… Nine per cent of schoolchildren’s eyes were suffering defects, dental standards were appalling, a full set of teeth being a rarity in working-class mouths… A 1937 survey…found only 12 per cent of 1638 children free from rickets with two-thirds showing serious signs of the disease. Another survey found alternations in pelvic bones of mothers due to diet deficiency in 40 per cent of women attending the antenatal centre. The Workers’ Birth Control Group campaigned…with the slogan, ’It’s four times as dangerous to bear a child as to go down a mine’.” David Widgery, Health in danger: the crisis in the National Health Service, Macmillan, London, 1979, p. 24. 3. The USA health system can be seen to be the polar opposite to that of the NHS. It is a system based on the private provision of health care and funding is based on private medical insurance – with the state merely providing a safety net for those unable to provide for themselves such as the old and the poor. The result is the rich are overtreated and the majority of the population are undertreated. Over 40 million Americans do not have any health care cover at all. Half the population have medical insurance that falls far short of being fully comprehensive. Although the US has some of the most advanced medical and surgical facilities in the world it also has some of the worst health services for any advanced capitalist economy. Infant mortality rates in many of America’s inner cities are comparable to levels in the third world. 4. Over the past decade total spending on health as a proportion of GDP rose from a little over 6% to 9.8%. In the USA total spending on health (i.e. both public and private) was 17% in 2010. In Holland it was 12%, in France it was 11.8%, in Germany it was 11.6%, in Canada it was 11.3%, in Spain and Italy it was 9.5%. Source: OECD Health Statistics. France it was 11.8%, in Germany it was 11.6%, in Canada it was 11.3%, in Spain and Italy it was 9.5%. Source: OECD Health Statistics. 6. “The Conservative party waits in the wings with even more Draconian policies: abolition of health centres, reintroduction of health insurance, and fees for hospital admission and home visiting by doctors.” Widgery, Health in danger, p. xv. 7. See A. Pollock et al., NHS plc: the privatisation of our health care, Verso, London 2004; J. Lister, The NHS after sixty: for patients or profits?, Middlesex University Press, London 2008. Also see ‘NHS R.I.P.’ special supplement to Red Pepper March 2006. 8. See Widgery, Health in danger, for a discussion of militant action by NHS workers in the seventies. 9. Her actual words in addressing the Conservative party conference were that the NHS would be ‘safe with us’. However, this has been usually interpreted as saying that the NHS was safe in her hands since her words held sway in the Conservative party. 10. This could be seen as a progressive change in that all too often the elderly had been simply ‘warehoused’ in hospitals. By shifting the responsibility for long term care of the elderly to the social services departments of the local authorities it was became possible to provide an integrated service that could support many more old people in their own homes. 11. Unlike the usual image of agency workers as being exceptionally exploited, due to the relative shortage of nursing staff and the highly skilled and trained nature of the work, qualified agency staff were generally able to command relatively high wages – alongside the large cut taken by the agency. While this came at the expense of benefits such as sick pay, job security, holiday pay, maternity leave etc., the use of agency staff was seen more as a way of ‘filling the gaps’ than as a way of cust-cutting or forcing flexiblisation. 13. For a report on the discussions with Thatcher’s cabinet over the review of the NHS see N. Timmins, The five giants: a biography of the welfare state, Harper Collins, London, 1995. pp. 453-480. 14. Exceptionally expensive drugs were exempted in order to prevent one or two patients with rare conditions requiring costly treatments exhausting a GPs budget limits. 15. The problems of PFI deals have been pointed out almost from their inception. However, such criticisms were largely dismissed as arising from the inevitable teething problems that would occur with any new system of procurement. However, the advocates of PFI have run out of excuses as the long term costs of such scams have become readily apparent. In the run up to the last general election even George Osborne and other Tories began to criticise the costs of PFIs. In August 2011 the Commons Treasury Select Committee condemned PFI as a waste of public money. 16. See C. Leys and S. Player, The plot against the NHS, Merlin Press, Pontypool, 2011. 17. See ‘Financial Turnaround in the NHS: A Report from Richard Douglass, Finance Director to the Secretary of State’, 25 January 2006, Department of Health. 18. See C. Leys and S. Player, Confuse & conceal: the NHS and Independent Sector Treatment Centres, Merlin Press, Monmouth, 2008. 19. Indeed, in March 2010 the Commons Select Committee on Health produced a report that concluded that the provider-purchase split that had been the foundation stone of the internal market had not been cost effective. See ‘Commissioning’, House of Commons Health Committee Fourth Report, Session 2009-2010. 20. See ‘Uncomfortable PMQs over Quangos and Strikes’, Financial Times, 29th June, 2011. 21. All this is already beginning to happen: see ‘NHS nurses fear Job losses’, The Guardian, 3rd October 2011 and ‘NHS cash crisis ‘will mean cuts to services or closure of departments’, The Guardian, 26th September 2011. The NHS has proved to be a remarkably cost effective means of delivering health care. Why should the capitalist state destroy a system that is so cost effective? What is it that has been behind the drive to the market?